A10 LightningTM ADC is the cloud-native ADC product line of A10 Networks. This is pure software, can be installed in any environment. A10 LightningTM ADC instances are stateless and are fully managed by Harmony Controller. This is purpose built for web applications implementing micro-services architecture and deployed in cloud or containerized environment. However, it works equally well for traditional applications deployed in data centers. A10 LightningTM ADC instances are deployed in active-active cluster i.e. all the members of a cluster are always active and share the load. Having stateless instances, a cluster is elastic in nature - new instances can added any time or existing instances can be shut down without significantly impacting the running traffic. The A10 LightningTM ADC cluster can either be deployed manually and associated with an A10 LightningTM ADC cluster or allow the Harmony Controller to launch A10 LightningTM ADC automatically. However, it also depends on cloud infrastructure user selects. The configuration page also provides user multiple options to deploy A10 LightningTM ADC. Deploying A10 LightningTM ADC depends on the underlying cloud infrastructure. At the very basic it is about setting up a virtual machine with the A10 LightningTM ADC software. A10 Networks releases pre-built Amazon Machine Image (AMI) of A10 LightningTM ADC for quick set-up. Harmony Controller is capable of launching A10 LightningTM ADC in users AWS account if the user is comfortable providing permission to the system for the same. Else, a user can launch A10 LightningTM ADC manually using a Cloud Formation Template (CFT), or from the Amazon marketplace. 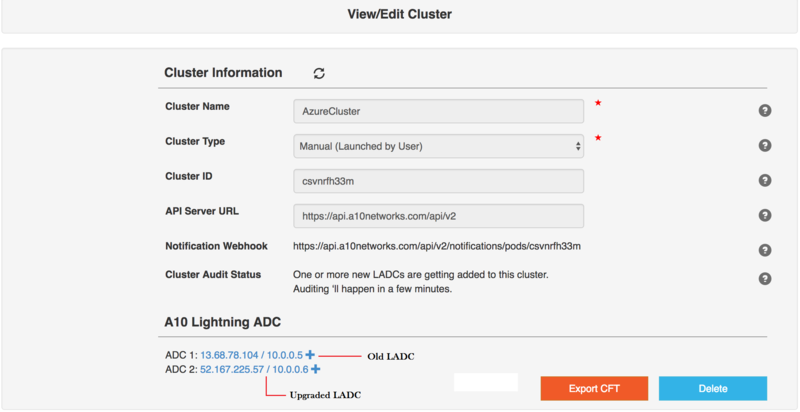 To automatically launch A10 LightningTM ADC cluster, choose the option Automatic cluster type in Create Cluster screen. For the auto launch of A10 LightningTM ADC cluster, an AWS credentials to be provided in the form of ARN by the user for the system to access various AWS resources of users AWS account. For more information on different user account authorization, please refer ARN Policy section in Infracredential configuration page. With the above set of information, the user also needs to provide the exact location regarding AWS region, network, and subnets where the A10 LightningTM ADC should be launched, and the scale up/down policy for the cluster in accordance with higher/lower CPU usage. When the required configuration is saved, the A10 LightningTM ADC instances are launched and automatically registered with the system into the specified cluster. List of all AWS resources created during the process as well as their status is shown on the cluster page. Click + to add a new cluster, provide the cluster name and then select the cloud credentials if already created. By default cluster type would be set to Auto. Once the above step is completed, select the Region and then select the Subnet(s) to launch the cluster, set the Min/Max Instances in the cluster. And then save the cluster, wait for the cluster to launch. Wait for the status to change to Launch Successful as shown. 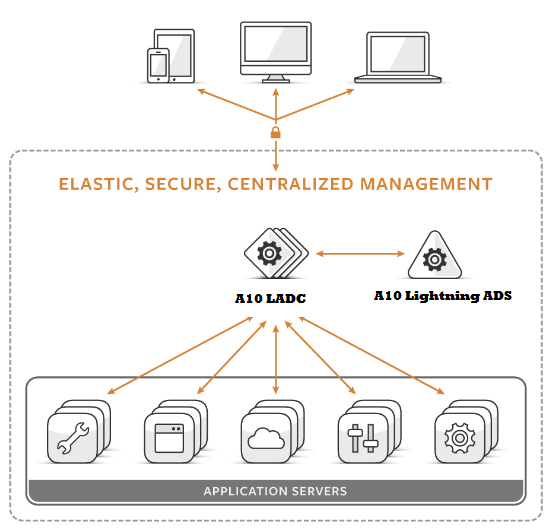 The A10 LightningTM ADC cluster is launched manually when the user is not comfortable authorizing the system to launch the instances and other resources to accesses users AWS account. And, if the user decides to use a Cloud Formation Template (CFT), all the steps are completely automated. Click + to add a new cluster, provide the cluster name and then select cluster type as Manual. Save the settings. Provide information about placement and scaling, but the system would not save this information. Generate a CFT by clicking Export CFT button using the above information, select the AWS platform; and then download the CFT and save it. Upload the CFT to S3 bucket of AWS. Click Services > S3 > Create Bucket > Bucket Name > Region > Create > Double click CFT created > Upload > Add/Upload CFT > Double click CFT Properties > Copy the Link address > Goto Services > Cloud Formation > Launch CloudFormer > Paste the Link address in the field Specify an Amazon S3 template URL> Next > Provide Key and Value > Review > Create. A10 LightningTM ADC instances launched using a system provided CFT is automatically registered with the system into the specified cluster. To launch the A10 LightningTM ADC cluster manually from AWS Marketplace, use the A10 LightningTM ADC AMI available in the AWS Marketplace. Follow the same process to launch A10 LightningTM ADC cluster in EC2-Classic as well. By manually launching the A10 LightningTM ADC instance, the user has the liberty to choose the placement of instances, but scaling and security implementation required to be configured manually by the user. Login to the A10 Lightning ADS and Click + to add a new cluster, provide the cluster name and then select cluster type as Manual. Save the settings as shown. Click this link https://aws.amazon.com/marketplace/ to access AWS Marketplace and search for A10 Lightning ADC or A10 LightningTM ADC and click on A10 Lightning ADC. Click Continue on this screen. Click Manual Launch and select the region to launch A10 Lightning ADC close to your App server. In this screen, you are configuring the instance details as shown, after providing the basic configuration details click Advanced Details and here click the As text radio button and provide the information such as Cluster ID, Edge IP, and API Server URL as shown in the example below. Copy the below JSON code in the User data field and change only the Cluster ID rest all remains the same. Click Add Storage provide the storage requirements or leave it default. Click Add Tags provide the Name and Value. Select a Key pair and click Launch Instance. Verify the cluster association with Harmony Controller in the cluster information page. 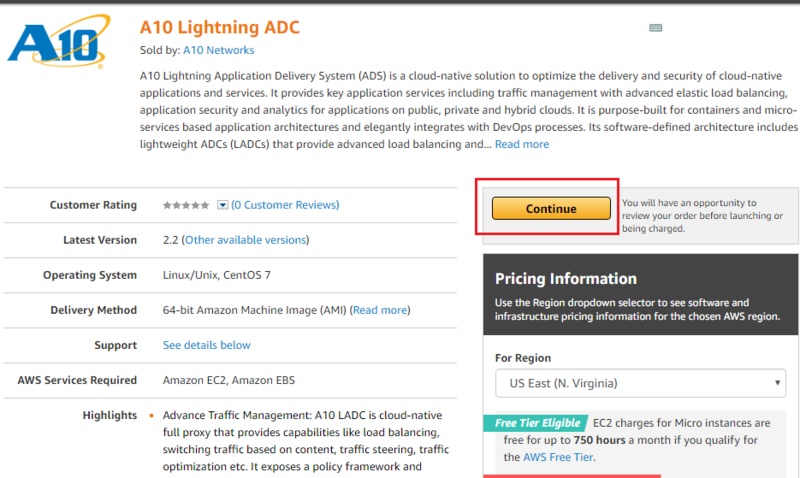 Follow step 2 to 5 from the “Launching A10 LightningTM ADC Cluster Manually from AWS Marketplace” before we proceed to next step. 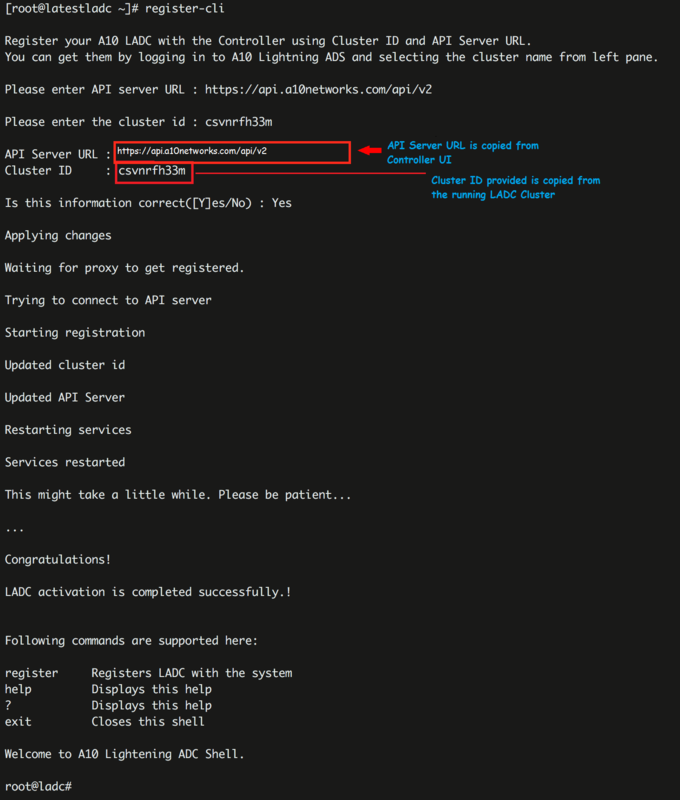 Click Create Launch Configuration provide the Name, and then click Advanced Details and copy the below JSON code in the User data field and copy the Cluster ID from the cluster creation page as shown in step 6 above, and then click Add Storage. Select a notification endpoint from the list if already created. Else, select create topic and follow step 10 to create a new notification endpoint. Review the Autoscaling group created. Verify the cluster association with A10 HarmonyTM Controller in the cluster information screen. The below steps are for the existing Harmony Controller customer’s who already have their A10 LightningTM ADC instance(s)running in AWS account and want to upgrade it to the new version. For that, the user needs to have the cluster ID of the existing A10 LightningTM ADC instance(s) running in AWS account and then follow the below steps. 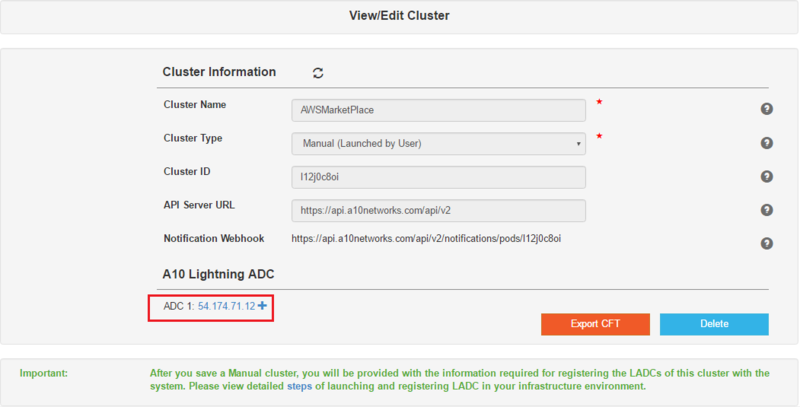 Login to Harmony Controller and look for the A10 LightningTM ADC Cluster which has the A10 LightningTM ADC instance already running in AWS account, then copy the Cluster ID as shown below. Click Advanced Details and copy the JSON code as shown below, and copy the Cluster ID of the existing A10 LightningTM ADC. The JSON code format is changed, do not use the old format to input the User data. Use the below one. Verify the cluster association with Harmony Controller in the cluster Information screen. Delete the old A10 LightningTM ADC instance once the new A10 LightningTM ADC instance Association is displayed on the screen. To upgrade the A10 LightningTM ADC version in Auto Scaling Group(ASG) of AWS account. Follow the steps below. Login to Harmony Controller and search for the A10 LightningTM ADC which is already in ASG of AWS. Look for the launch configuration information in the Cluster information screen. Click Launch Configuration in the AWS screen and search for the launch configuration which you found in Cluster screen. From the Copy launch configuration screen click Edit AMI and then click AWS Marketplace search A10 LightningTM ADC and select the radio button Yes, I want to continue with this AMI. In the Configure details screen click next. 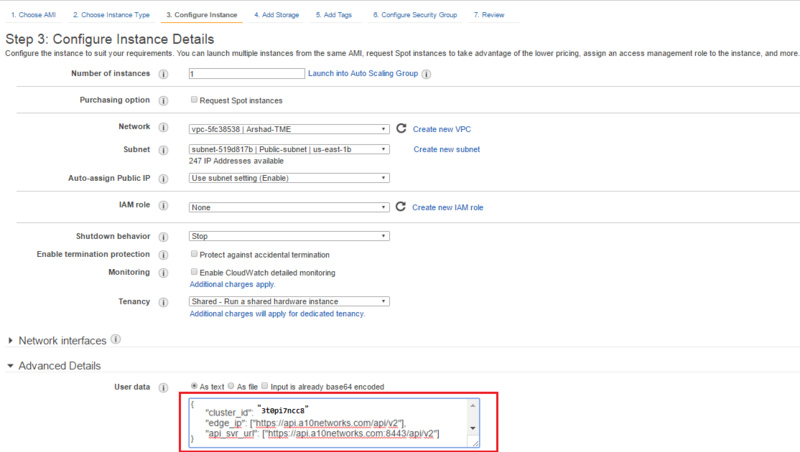 Select the existing security group for the A10 LightningTM ADC instance running and click Review. Select the existing key pair or create a new key pair. Click Auto Scaling Group choose the existing A10 LightningTM ADC instance and in the Details increase the desired instance (for example, if it is “1” change it to “2”) and wait for it to launch the new instance. Now we have two A10 LightningTM ADC instances, the old and the updated in the cluster page. Check for CPU stats for the new A10 LightningTM ADC instance, for analytics. In the AWS we have both the old and the updated A10 LightningTM ADC instances running. Hence, to make the updated A10 LightningTM ADC instance(s) active delete the old instance(s) by reducing the desired instance (for example, if it is “2” change it to “1”) in “Auto Scaling Group” screen and the old instance is automatically deleted by AWS. The old instance is terminated as shown. The cluster screen now shows only the updated A10 LightningTM ADC instance. To automatically launch A10 LightningTM ADC cluster, choose the option Auto(Launched by System) in the Add New Cluster page. For the Auto launch of A10 LightningTM ADC cluster, an GCP credentials has to be provided for the system to access various GCP launch resources of users GCP account. User is also required to select the appropriate Project to associate the cluster. For more information on creating GCP Credentials, refer Onboarding an Application section in the document. With the above set of information, the user also needs to provide the exact location regarding GCP region, network, and subnets where the A10 LightningTM ADC should be launched, and the scale up/down policy for the cluster in accordance with higher/lower CPU usage. When the required configuration is saved, the A10 LightningTM ADC instances are launched and automatically registered with the system into the specified cluster. List of all GCP resources created during the process as well as their status is shown on the cluster page. Please ensure that TCP port 5666 is open on your A10 LightningTM ADC node. As a part of A10 LightningTM ADC image creation, we install NRPE (Nagios Remote Plugin Executor) plugin which allows cloud team to monitor A10 LightningTM ADC’s remotely. Services using NRPE daemon binds to port 5666 by default. This will allow us to alert your team in the occurrence of any events. If you have to monitor in place, you can decide NOT to open TCP port 5666. This holds good for both manual and auto launch of A10 LightningTM ADC. Click + to add a new cluster, provide the cluster name and then attach the cloud credential, and select the appropriate Project as shown. By default cluster type would be set to Auto. The A10 LightningTM ADC cluster is launched manually when the user is not comfortable authorizing the system to launch the instances and other resources to accesses users GCP account. The View/Edit Cluster screen provides the user the metadata information like Cluster ID and API server URL which is used to associate the cluster with GCP. Login to the GCP using the Google account credentials. Click Product and Services on the left top corner, and from the drop-down select Compute Engine > Instance Templates > CREATE INSTANCE TEMPLATE. Input the instance name and keep other fields as default, expand [Management, disk, networking, SSH keys] and then provide the metadata information(cluster ID and API server URL or Edge IP) exactly as shown in the figure below. Create an Instance group and associate the Instance template with the Instance group as shown. Keep all the fields set as default. Select an existing instance or select an instance template. And then, click Create. View the status of the A10 LightningTM ADC cluster instance. 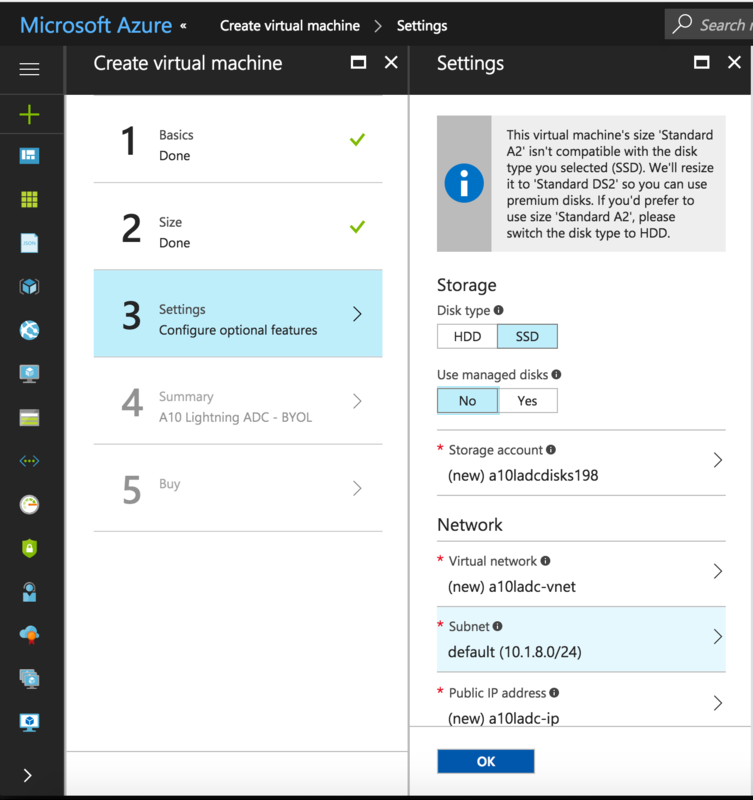 To launch the A10 Lightning ADC cluster in Azure account, use the Azure machine image provided by A10 Networks in Azure Marketplace. By manually launching the Lightning ADC instance the user has the liberty to choose the placement of instances. But, scaling and security implementation required to be configured manually by the user. 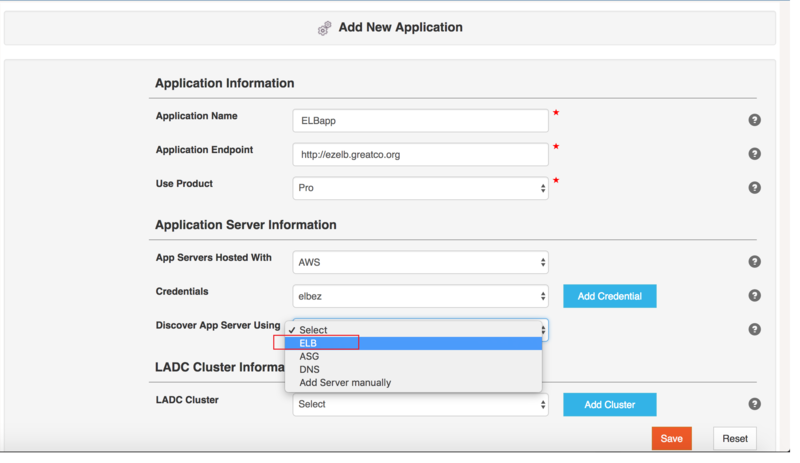 To automatically launch LADC cluster, choose the option Auto(Launched by System) in the Add New Cluster page. For the Auto launch of LADC cluster, Azure credentials should be provided for the system to access various Azure resources in User’s Azure account. For more information on creating Azure Credentials, refer Onboarding an Application section in the document. Once the user selects Azure credentials, user has to select the region to launch the LADC Cluster. Using Azure credentials, system will search for all the networks in that region. User can filter the list of networks and subnets by name of the resource group to which they belong. Please note that in Azure, resource group can be in a region and resources inside that resource group can be in a different region. User interface shows all the resource groups which have virtual networks in the selected region. LADC Cluster is launched in it’s own new resource group, but it will share the virtual network selected by the user. User should select appropriate network to provide required connectivity between application servers and LADC Cluster. On selecting the network, user needs to select instance type and number of instances required in the cluster. User can provide list of static IPs to be associated with the LADC instances. If no static IP is provided, system launches new LADC instance with new static IPs. 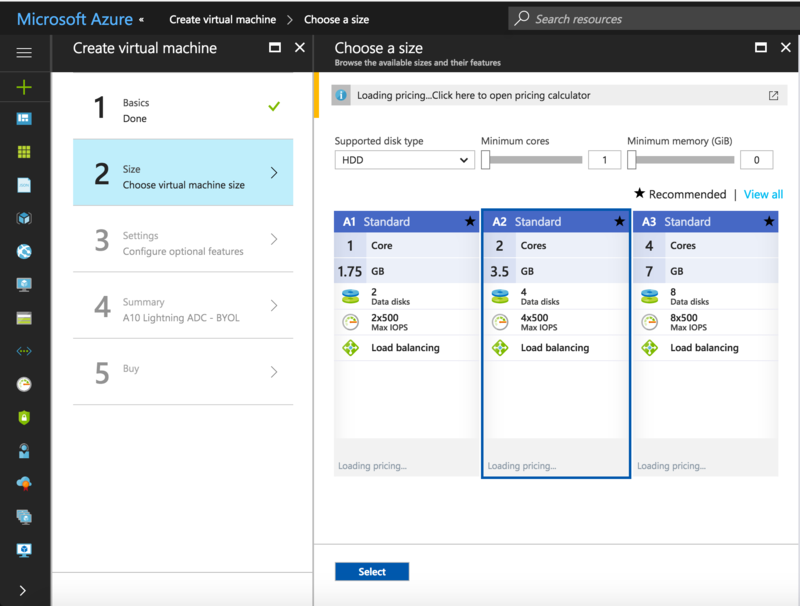 Azure allocates the same IP to same VM, if the VM instance restarts for some reason. System creates a new resource group in the selected region and launch selected number of LADC VM instances in that resource group. Each VM will have a NIC associated with a static IP and it will be in selected subnet or network. System also creates a Network Security Group (NSG) in the same resource group, and this NSG is associated with NIC of all the LADC VM instances. This NSG will have few incoming rules like SSH Port 22 allowed from whitelist IPs and TCP port 5666 allowed. Whenever an application is associated with this cluster, that application’s incoming ports is also added to this NSG to allow traffic through LADC. User should make sure that if there is an NSG associated with the subnet which the user selected in the configuration, the subnet NSG should have application traffic ports listed in the incoming rules. Please ensure that automatically launched LADC by system in Azure are not deleted manually from Azure Portal. If an auto launched LADC is manually deleted from Azure Portal, system will not be able to manage it and also there will be impact on application traffic with unknown consequences. Please ensure that TCP port 5666 is open on your LADC node. As a part of LADC image creation, we install Nagios Remote Plugin Executor (NRPE) plug-in which allows cloud team to monitor LADC’s remotely. Services using NRPE daemon binds to port 5666 by default. This will allow us to alert your team in the occurrence of any events. If you have to monitor in place, you can decide NOT to open TCP port 5666. This is applicable for both manual and auto launch of LADC. 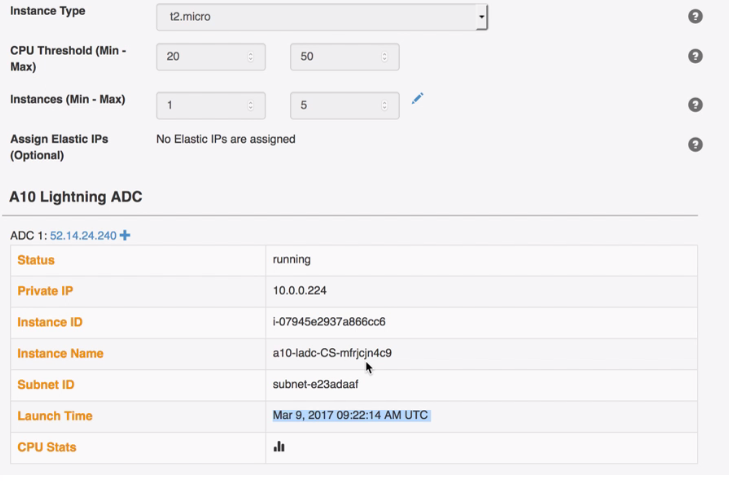 User can provide a minimum and maximum number of instances for a LADC cluster. On launching, system will start minimum number of LADC instances. System will scale up the number of instances based on CPU utilization of running instances. If average CPU utilization of running instances goes above 50% for more than two minutes, system will scale up one more instance. System will not scale more than maximum number of LADC instances specified in configuration. If average CPU utilization of running instances goes below 20% for more than four minutes, it will scale down one instance. There is a cooling period of five minutes, between two scale events. Click + to add a new cluster, provide the cluster name and then attach the cloud credential. By default cluster type would be set to Auto. Once the above step is completed, select the Region and then select the Network and Subnet(s) to launch the cluster, set the Max Instances in the cluster and select instance size. And then save the cluster, wait for the cluster to launch. 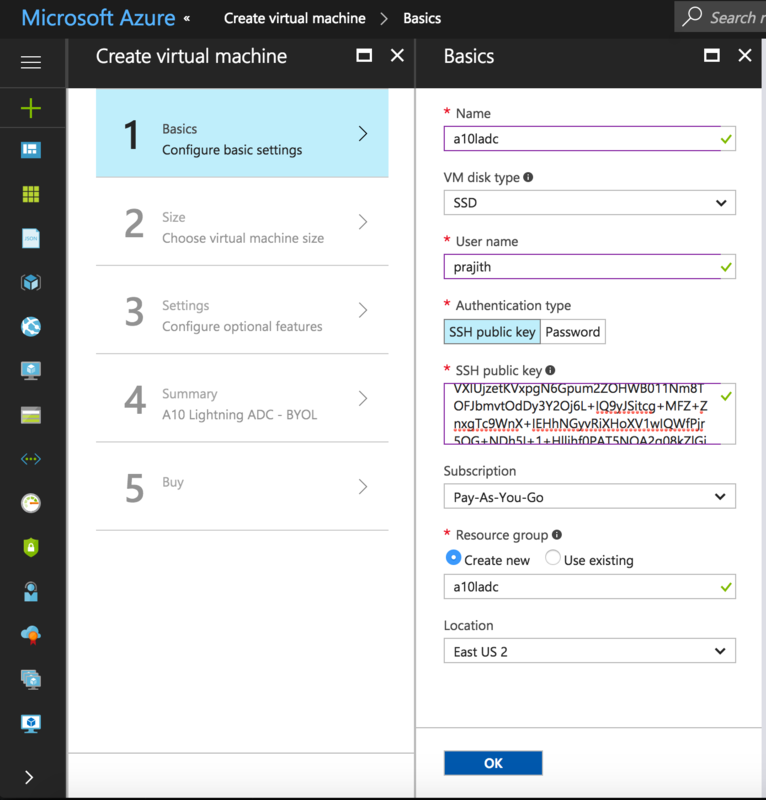 Login to Azure Marketplace and search for A10 LightningTM ADC, from the search results select A10 Lightning ADC-BYOL to launch VM as shown. After the successful launch of A10 LightningTM ADC, SSH to A10 LightningTM ADC instance with the user-defined username and password. Waiting for the proxy to get registered. LADC activation is completed successfully.! 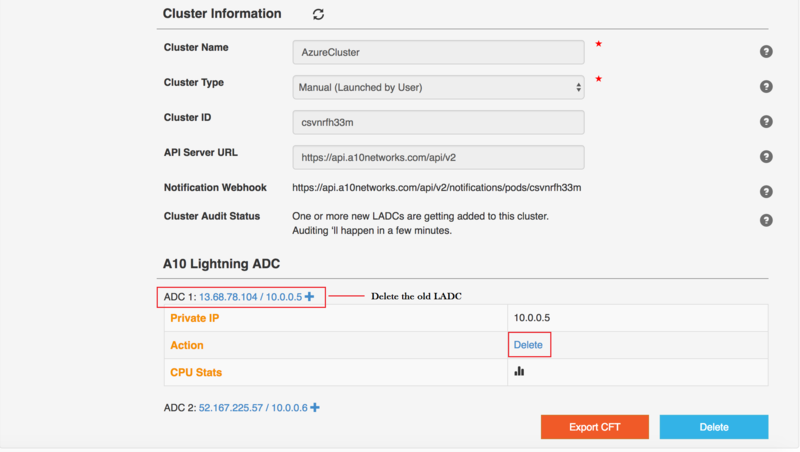 After successful registration of Lightning ADC in Azure Marketplace, go back to the A10 Lightning ADS Cluster page and refresh the page to view the association of A10 LightningTM ADC with A10 Harmony Controller. 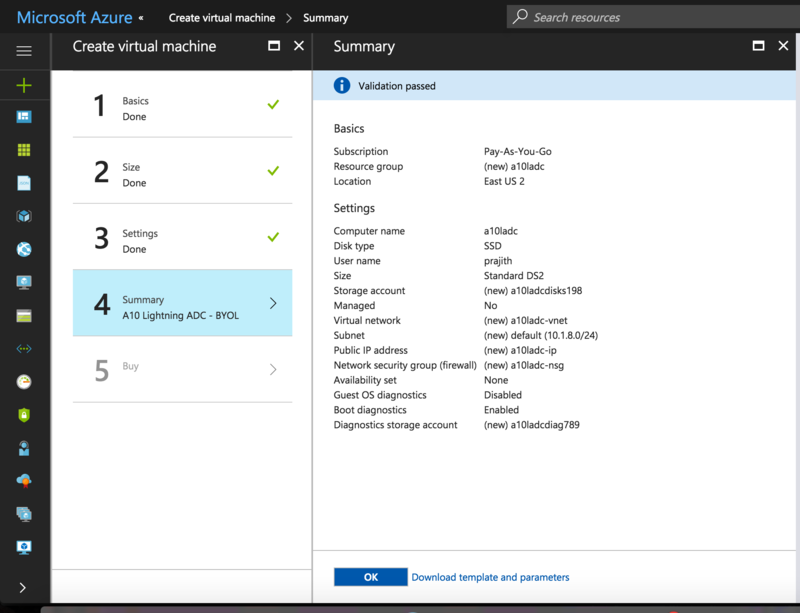 This section of the document provides the steps to upgrade the A10 LightningTM ADC version in the Azure Infrastructure. 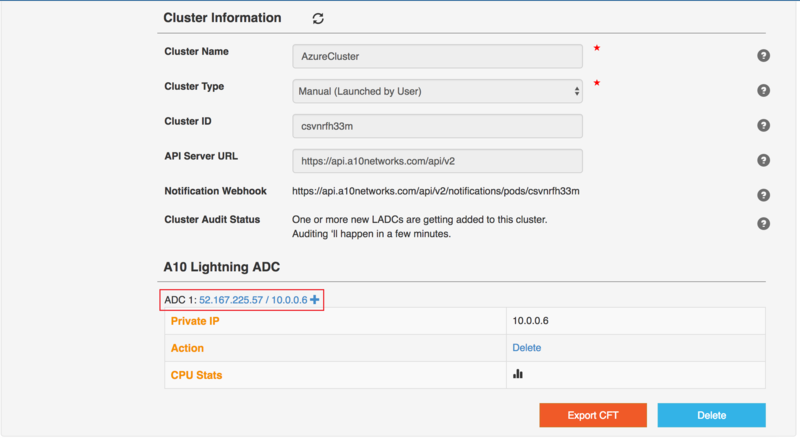 Copy the cluster ID from the running A10 LightningTM ADC cluster and keep it ready. After the successful launch of A10 LightningTM ADC, SSH to A10 LightningTM ADC instance with username and password. When the above command is executed it prompts for the cluster ID, the user can provide the cluster ID of the running A10 LightningTM ADC. Once the upgraded Harmony Controller associated with the A10 Harmony Controller, the user can delete the old A10 LightningTM ADC. On successful deletion of the old A10 LightningTM ADC cluster, the cluster page displays only the upgraded A10 LightningTM ADC cluster. Docker containers are based on open standards, enabling containers to run on all major Linux distributions and on Microsoft Windows and on top of any infrastructure. 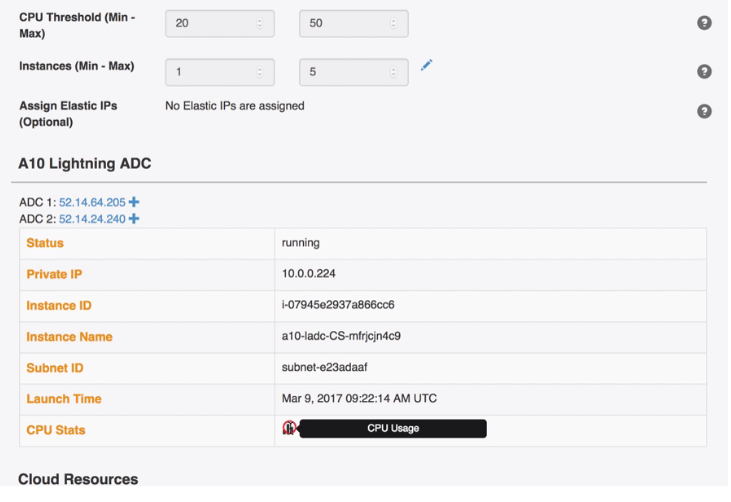 Harmony Controller user can deploy A10 Lightning ADC instances in Docker container. 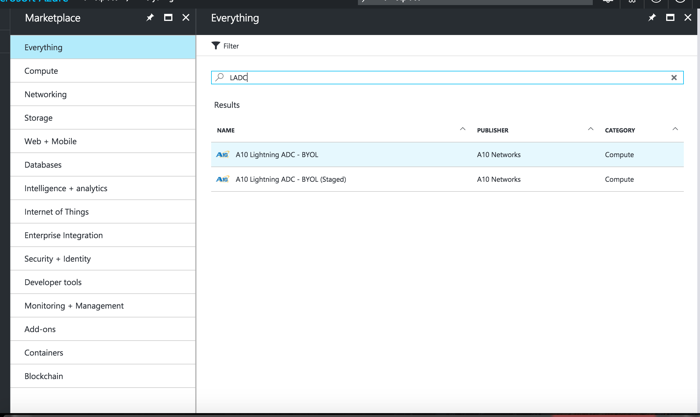 This makes the deployment independent of underlying infrastructure and Lightning ADC can be deployed near to application servers where ever servers are deployed. The user is expected to have the Docker engine installed, before starting the A10 Lightning ADC deployment. 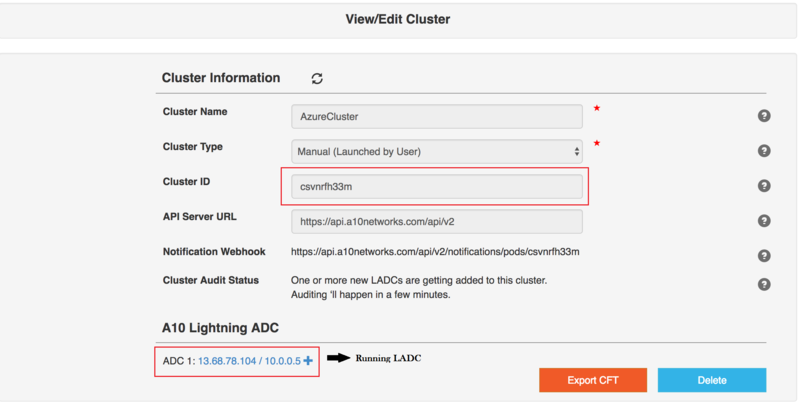 Also, the user should have the Lightning ADC cluster configured in Harmony Controller to obtain a cluster ID and API server URL. Login to Harmony Controller and click Add New Cluster provide the cluster name and select cluster type as Manual and then click Save. Copy the cluster ID and API server URL from this page. This docker command automatically restarts the container on a reboot. Note, this will make sure the container is restarted automatically if it is stopped. This applies on a reboot or in some circumstance the container exited for whatever reason. Best practice is to map them to same port both on host and container. However, different ports can be used to map between host and container, just, make sure the host and the container port are mapped properly to avoid any port conflict. An Application includes configurations that are required for Application delivery and allows the user to add many more complex policies as needed. To save an application, provide at least name of the application and traffic endpoint for the application. A user can add more configuration once the application is created. To activate an Application, the user must provide details of application servers which are serving application traffic and associate a valid A10 LightningTM ADC cluster which has A10 LightningTM ADCs launched and running. Add Credentials or Use the existing. Add A10 LightningTM ADC Clusters or Use the existing. Click + to add a new Credential. 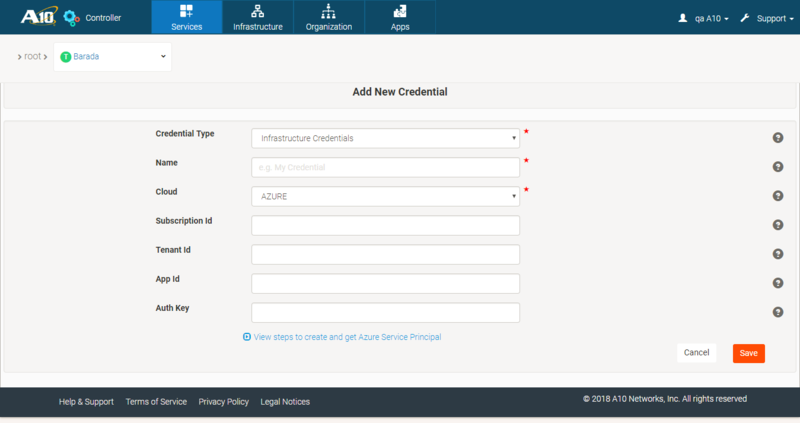 Select the Credential Type as Infrastructure Credentials. Select the cloud type as AWS. 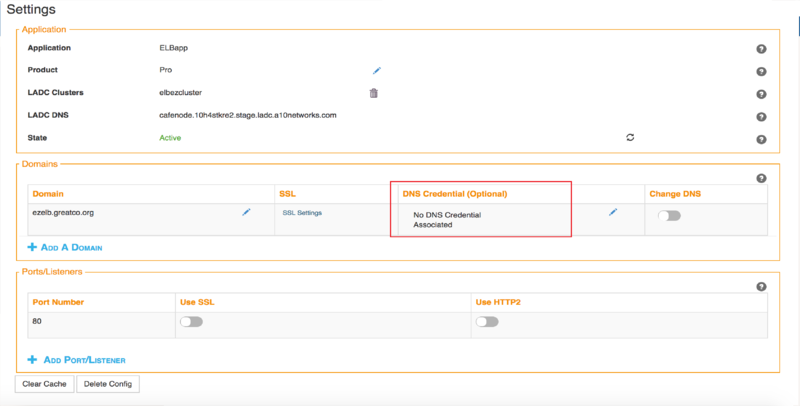 Check the box Use same ARN for DNS (Route53) credential to provide the AWS account access for A10 Networks to manage Application configuration on the cloud. Input the ARN Role. Click View steps to get Role ARN, and follow the on-screen instructions to get the ARN role. Select the cloud type as GCP. Click View steps to get Service Account Credential, and follow the on-screen instructions to get the service account credentials. Click + to add a new Cluster. Under Cluster Information, provide the Cluster name and select the Cluster Type as Auto. Under Infrastructure Information, select the Cloud type as AWS and select the Cloud Credential which is already created. If not created, then click Add Credential button to create one. And then, Save the configuration. Under Cluster Information, provide the Cluster name and select the Cluster Type as either Auto. Under Infrastructure Information, select the Cloud type as GCP and select the existing GCP cloud credential. If not created, then click Add Credential button to create one. And then, Save the configuration. After selecting the GCP cloud credentials, select the appropriate project. 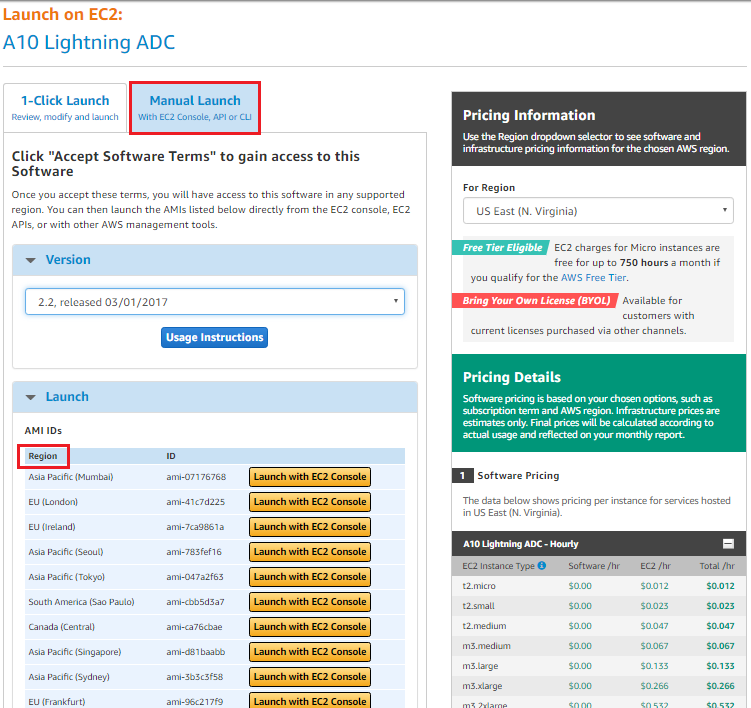 Fill-in all the fields under A10 LightningTM ADC Launch Information and click Save and Launch. View the A10 LightningTM ADC launch status on this screen. Click + to add a new Application. Under Application Server Information, choose the Discover App Server Using option from the list; whichever is appropriate. Under A10 LightningTM ADC Cluster Information, select the A10 LightningTM ADC cluster which is already created. If not created, then click Add Cluster button to create one. And then, Save the configuration. The steps below are to add a new application in A10 Lightning ADS and discovering application server using AWS ELB. In the above nslookup output, application endpoint resolves to CNAME of ELB. Now, in the further steps, we can see how to change the DNS from CNAME of ELB to A10 LightningTM ADC DNS. Click + to add a new application and provide all the information such as application name, application endpoint and so on. Then, in the Application Server Information section select AWS in the App Server Hosted With field and provide credentials and then, select ELB in the Discover App Server Using field as shown. On selecting ELB in the Discover App Server Using field, the ELB name and app server IP is discovered by A10 Harmony Controller. In this step, we can see the DNS is not updated yet and the application is still using the CNAME of ELB for load balancing the traffic. Update the DNS credentials as shown, click Edit and update, and then select the DNS server and then click Update DNS. Updating the DNS will start routing the traffic through A10 LightningTM ADC. On updating DNS credential, click Change DNS. On successful completion, the message is displayed. Now, the nslookup output resolves to |LADC| DNS, which is to confirm that the traffic is routed through the A10 Lightning ADC DNS. Harmony Controller offers comprehensive load balancing functionalities such as elastic, secure, and centralized management of cloud applications. However, its main advantage comes from its use of cloud infrastructure to dramatically improve application deliveries in the cloud and data centre environments. The figure below shows the deployment of the Application Delivery System (ADS) on a full scale. Extends the traditional load balancing services with content switching and session persistence. Specifies policies to optimally fulfill user requests. Offers real-time application analytics, also provides adjustments for loading balancing policies. In the case, where your organization is migrating its legacy applications from the data center, or building a new container based micro service applications in the cloud. The Harmony Controller load balancer deploys in minutes through an application-intimate proxy in your availability zone. The Harmony Controller Elastic Load Balancing(ELB) service enhances the cloud application capacity, flexibility, and visibility without any changes to application code. Harmony Controller accepts the client requests for the domain names configured as application domains. When you on-board A10 HarmonyTM Controller, it creates an application domain by default (based on your application endpoint). In Harmony Controller goto Tenant > Tenant Name > Edit Configuration > Application > Settings screen. Select Add a Domain, enter the domain name (For example, www.example.com), and then click Save to add an application domain. You can add as many Fully Qualified Domain Names (FQDNs) as application domains, using the Add a Domain option. Wildcard (*) may be used for specifying all the sub domains of a domain. If you have multiple domains, you can delete a domain by simply clicking Delete button, and then clicking the Delete Domain button. Application DNS refers to the DNS name of A10 Lightning ADC. If you are using a third-party DNS provider, then when you choose the option Other while adding your application, you need to change the DNS record of your Application Domain in the DNS Provider such that it points to Application DNS. And then, manually replace the CNAME record in your DNS provider with the Application DNS URL in this field. If you choose Route 53 as your DNS provider, this step is automated. You need a public DNS entry (For example, www.example.com or app.example.com) with DNS service provider of your choice for enabling users to access your application. Typically, the DNS entry is a ‘CNAME’ record or an ‘A’ record in your application domain’s hosted zone file. Once you have completed required configurations, select Change DNS on the Settings Page. A message pop-up is displayed asking if you want to update the DNS information. When Change DNS button is selected, the traffic from the application domain is routed through the A10 Lightning ADC. The A10 LightningTM ADCs deployed, are your application Front End at this step. Note, that until you enable Harmony Controller, traffic does not pass through the A10 LightningTM ADC. The above steps complete the on-boarding process in Harmony Controller. Harmony Controller listens for application traffic on the listening ports. To add a port(s)in the settings screen click on ADD PORT/LISTNER option. You can even add multiple listening ports if required. Before adding any HTTP2 or SSL ports make sure SSL is enabled. If you have multiple ports, you can delete a port by simply clicking Delete button, and then clicking the Delete option. Each Application Domain with Fully Qualified Domain Names (FQDNs) requires its SSL settings if SSL is enabled on Harmony Controller. When you add a new application domain and want to copy the SSL settings of an existing domain to the new one, use the Copy SSL Settings option. SSL Certificates (also called digital certificates) is enabled to establish a secure encrypted connection between Harmony Controller and Application Servers. The SSL connection protects sensitive data exchanged during each session. To enable SSL, you need to have a valid SSL Certificate that identifies you and install it on the application server. A padlock icon is used to indicate the usage of SSL certificate in a web browser. However, it can also be shown by a green address bar. Once SSL installation is complete, you can access Harmony Controller securely by changing the URL from Http:// to Https://. When an SSL certificate is installed on the application server, you can be sure that the information you enter is secure. When you enable SSL in A10 HarmonyTM Controller, the below options are displayed. Click on the relevant help buttons to get more information on these options. If SSL is already configured in a domain, we can copy the same config to newly added domains. Click on the Copy SSL settings and select the domain to copy SSL settings from in the left section. Select the domain to copy SSL settings to in the right section and click on Copy as shown in the figure below. HTTP/2 is the next-generation protocol for transferring information on the web, improving upon HTTP/1.1 with more features leading to better performance. It manipulates HTTP traffic, with particular goals of reducing web page load latency and improves the web security. This policy can only be enabled with SSL. A service is identified by a traffic condition and a set of servers that serve traffic for client requests that match the traffic condition. When we configure an application a default service is created with the servers discovered/specified while onboarding an application. When the traffic is served from a different set of servers. When the traffic is served from various ports of the same set of servers. If there are multiple services, they can be reordered using the up/down arrow icons based on which service the traffic should pass through. When you add a service, you can configure traffic conditions within the service, and when there are client requests that match these service conditions they are served by the application servers. Enter the URL path value. Enter the header parameter name and value. Enter the query parameter name and value to present in the query string in a GET request. Select the scheme as Http or Https. The Http method on which this request is made. There are 4 Http methods; they are GET, POST, PUT, and DELETE. Enter the POST Body Parameter value in the POST Request. The country code for the client network. This code is a two letter or three letter code or full name of the country. Network IP Address of the client network. Use the logical operators AND and OR to combine multiple conditions and form a single final service condition. Once you have created a service, you can edit the service configurations later if required, using the pencil icon. The Application Servers configured within the service are displayed in the Servers section. These servers provide/serve traffic that matches the conditions specified in the service. You can edit the application server configuration using the adjacent pencil icon (View/Edit Server Group). The Edit Servers window is displayed where you can modify the application server information. Load balancing distributes client requests across multiple servers to optimize resource utilization. In a scenario where a limited number of servers provide service to a large number of clients, a server can become overloaded degrading server performance. Load balancing is used to prevent bottlenecks by forwarding the client requests to the servers best suited to handle them, thus balancing the load. Load balancing uses algorithms called load balancing methods, to determine how the load is distributed among the servers. When a load balancer is configured to use the least connection method, it selects the server with the least number of active connections to ensure that the load of the active requests is balanced on the services. This method is the default load balancing method because it provides the best performance. This method is used when you do not want to overload a busy server and distribute the load to other servers which are relatively less loaded. Round-robin load balancing is one of the simplest methods for distributing client requests across a group of servers. In this mode of load balancing, the load balancer passes each new connection request to the next server in line, eventually distributing connections evenly across the array of machines being load balanced. When it reaches the end of the list, the load balancer loops back and goes down the list again (sends the next request to the first listed server, the one after that to the second server, and so on). When configuring a service in Harmony Controller, choose the round-robin load balancing method if there are enough number of client requests and when they need to be processed almost equally and fast enough among the available servers. Also, note that round-robin method should be used when application servers are stateless and sessions are managed centrally at the back-end. In the IP Hash load balancing, the client’s IP address is used as a hashing key to select the server (from the server group) to which the client’s requests are directed. This load balancing method ensures that the requests from the same client are always directed to this server, except when the server is unavailable. This mode is particularly useful when you want to direct requests from the same client to the same server always. The IP hash method is useful when your application servers are stateful. In the IP Port Hash load balancing, the client’s IP address and Port number are used to calculate the hashing key to select the application server (from the server group) to which the client’s request is directed. As long as the IP address and the port number remain the same, the client’s requests are directed to the same server. But if the port number changes (but the IP address remains the same), the client’s requests are directed to a different server. Also, when the port number varies on the same client machine, the client’s requests are redirected to a different server. In Harmony Controller, load balancing is always enabled and defaults to ‘Least Connections’ even if the checkbox is unchecked. You can choose ‘Round Robin’ or ‘IP Hash’ by selecting the corresponding radio button. Session persistence refers to directing a client’s requests to the same back-end web or application server for the duration of a “session” or the time it takes to complete a task or transaction. Also, we can redirect the same client to the same server, using the session persistence. A session is defined as a series of transactions between a client and a server, over some finite period of time– ranging from several minutes to hours. If you want to tie a client to a particular application server, use the cookie sticky option; this makes the client’s session “sticky” or “persistent” in accessing a particular server. Cookie-based session persistence provides a stateless solution for session persistence by storing all session data in a cookie in the user’s browser. Cookie-based session persistence is most useful when you do not need to store significant amounts of information in the session. You can specify a header offset (in the HTTP header) to provide stickiness (or session persistence), based on a unique portion of the HTTP header. The query parameter in the HTTP GET request. For example, in the HTTP request http:// www.abc.com/w/index.php?title=Main_page&action=raw, the query parameter name is the title. Location Affinity provides the capabilities to load balance the inter-zone traffic, distributing the traffic evenly across the application servers with location aware load balancing. Location Affinity supports Affinity Only and Affinity Weight options which give the user the flexibility to load balance the traffic more precisely within the Zone. The Location Affinity is supported only in AWS. When Location Affinity is enabled, it is recommended to disable the Session Persistence to avoid any interoperability issues. When this option is enabled Lightning ADC will only use Application Servers with the same zone as itself. Other Application Servers will only be used in case all local Application Servers are out of service. When Affinity Only is enabled, Affinity Weight option is ignored. When this option has been enabled the weight of the zone local server is multiplied by the Affinity Weight specified in the filed. For example, Assume these are the servers configured along with their weights. For every 3 requests, A10 LightningTM ADC will push 2 requests to 190.168.128.31 and 1 request to 190.168.128.32. By adjusting Affinity Weight, the user can keep more requests within the same zone as Lightning ADC. The Location Affinity is configurable both in the existing default service and also in the new service after on-boarding. To configure Location Affinity in the default service, click View/Edit Server Group and enable the Location Affinity as shown. Note, by default the Location Affinity feature is disabled. To configure Location Affinity for a New service in A10 Lightning ADC goto Services > Add New Service > Server Information > Location Affinity. Select the AWS in the server field. When Affinity Only is enabled the Affinity Weight is disabled and the Affinity Weight is enabled since Affinity Only is disabled. When adding a new service in Harmony Controller, you can configure out-of-band monitoring of application servers where Harmony Controller probes actively whether the application servers are active or not. You need to specify the monitoring protocol (TCP/HTTP, or secure TCP/HTTP connections), monitoring interval, and timeout. You can monitor the Application Server Health from the Dashboard. You can set the protocol over which Harmony Controller provides application server monitoring. The protocol can be TCP or Http. For secure monitoring, use SSL over TCP or Http options. When you select the monitor protocol such as Http or Https, you must also specify the Monitor URL. In this case, Harmony Controller probes the monitor URL specified. Note that this field is visible only when you select Http or Https. The time (in seconds) for which the application server is probed and monitored. The time (in seconds) after which the monitoring probe should timeout, within the monitoring interval. When you configure a new service in Harmony Controller, you can specify the required timeouts when requesting information from the application server or when getting a response from the application server. Here you can specify the time within which you want to close the connection to the application server if you cannot read the required information from the server within this specified time. For example, suppose you have set this timeout value to 300 seconds. If you want to download information from the server, and if the task takes more than 300 seconds (say 500 seconds), your connection to the server closes in 300 seconds as the timeout value is 300 seconds. So you may increase this timeout value to 500 seconds so that your download is complete. Here you can specify the time within which you want to close the connection to the application server if you cannot write the required information on the server within this specified time. For example, suppose you have set this timeout value to 300 seconds. If you want to upload information to the server, and if the task takes more than 300 seconds (say 500 seconds), your connection to the server closes in 300 seconds as the timeout value is 300 seconds. So you may increase this timeout value to 500 seconds so that your upload is complete. Secure Sockets Layer(SSL) can be enabled to establish a secure encrypted connection between A10 Lightning ADC (or proxy) and application servers. The SSL connection protects sensitive data exchanged during each session. To enable SSL, you need to get an SSL Certificate that identifies you and install it on the application server. When an SSL certificate is installed on the application server, you can be sure that the information you enter is secure. When you enable SSL between A10 Lightning ADC (or proxy) and server, following options are displayed. Click on the relevant help buttons to get more information on these options. Select the option to configure fall-back if all servers go down. To enable the options, do the following. Choose an existing service to which you can redirect the traffic when your service is down. Provide the response code and URL to which you can re-direct the traffic when your service is down. Provide the redirect URL to which you can redirect the traffic when your service is down. The Backend Server Surge Protection policy prevents the backend server from getting overloaded with indefinite traffic, which may cause the server to perform inefficiently. With this policy, the user can limit the traffic flow to the server and limit the keep alive time for a connection based on the values set. The two fields which are Connection Keepalive Timeout and Maximum Number of Request Per Connection allows the user to set the connection keepalive time and maximum request allowed in a connection. It is recommended to set the connection keepalive timeout value as “4”, which means if the connection is ideal with no requests coming in for 4 seconds the connection is closed. Similarly, the user can set the maximum number of requests allowed per connection. Once you create a service, you need to activate the service so those | ADS| passes traffic through the application servers configured within the service. Form the Services Screen click on ADD NEW SERVICE and in the next screen configure a new service. Click on Activate button to enable the Service. To deactivate a service, click on De-activate button and then select De-activate option. When you create a new service, a default SmartFlow is created with the traffic condition(s) defined in the service. New smart flow is created when policy configuration is required for a different smart flow condition. In this case, a request from the client will hit the smart flow if the condition matches. When multiple smart flows are created, it can be reordered as required. Click Add a SmartFlow and provide the Smartflow Service details as below. Set the Smartflow conditions in the respective fields. User can select from the device types available in the drop-down as logical conditions and configure policies accordingly to create a new smart flow. User can select from the available OS in the drop-down as logical conditions and configure policies accordingly to create a new smart flow. Users can select the browsers available in the drop-down and set policies to create a new smart flow. User can enter the browser version as condition and set policies to create a new smart flow. Logical Operators AND OR can also be used to combine multiple conditions such as browser AND browser version and form a single final service condition. Set up alias response codes or alias response URLs that the A10 Lightning Application Delivery Controller should provide the user, for the response codes coming from the Application server. Whenever a new smart flow is created, it needs to be activated [using the enable/disable button]. In the case of multiple smart flows, if one is deactivated the traffic will hit the one which is below in order. The URL Rewrite policy helps you to rewrite complex URLs into user-friendly and search-friendly URLs without changing the page structure. When you have multiple URL rewrite rules and the action for all of them is to continue to next rule, at the end, Lightning ADC will see the URL is changed and will automatically trigger a new service and smart flow match. If you do not want to continue to the next rule, you must explicitly call break. URL rewrites must be used only if you want to modify the rewritten URL again. After rewriting the URL, do the following; Choose an option from After Rewrite drop-down box. These options are used to apply specific rules to re-written URLs. Enable the policy using the Enable button. Finally, enable the Case Insensitive button, this allows the server to ignore cases in rewritten URLs. You can control the display of text, headers and error code to web page visitors by using Body Rewrites function. Enter the Regex or String value in the field named Match. Enter a new string value or Regex in the Replace With field, and click Enable button. Enable Case Insensitive button, this is optional. In Harmony Controller, you can specify a Cross-Origin Resource Sharing (CORS) policy which includes Http headers to allow communication between pages from different origins. You may want to enable CORS policy only if you have such a use case. Here, you need to define the domains allowed to share resources with your servers. You should specify this using base URL where wildcard (*) denotes all subdomains. Only GET and POST methods are allowed. For example, specifying https://.example.com in the policy allows any page from any sub­domain of example.com to share a resource with your server over Https. You can specify more than one base URL by pressing the **+* Add More option. You can specify rules or action policies that return custom content to the user (For example, an alias response code), for the response codes coming from the application server. For instance, if you want to hide a particular response code from the user, you can specify an alias code in the action policy configured in the A10 Lightning ADC, so that the user sees the alias code instead of the response code that you want to hide. However, when Allow merging of Rules option is enabled then the Return custom content security policies set at the Application level is merged with the Action policies settings, if Allow merging of Rules option is disabled then policies set under Action policies holds good for Smartflow traffic. And, if Action policies are disabled, then by default Return custom content settings holds good for application traffic. The compression policy is used to deliver content or data faster by reducing the amount of data that is transferred. The speed of data transfer increases with data compression. While defining the compression policy, you just need to provide the minimum size you want to compress and the type of content to be compressed. The minimum compression size is an integer value measured in bytes, and the type of content that to be compressed can be plain text/HTML or just plain text. In Harmony Controller window click Tenant > Tenant Name > Edit Configuration > Services > Add a Smart Flow. Select Performance under Policies and then select Compression. Enter a number in the Min Compressible Size (bytes) box. This number specifies the minimum file size for compression. Compress any text or application content by choosing any one of the options as listed in Content types. You can use Analytics > Metrics menu to see the compression policy metrics for a selected service. Browse through the charts to see the Compression policy-related metrics. Caching reuses information stored earlier to respond to a client request, to reduce data traversing on a network and decreases response times. HTML pages are cached automatically, hence, activating this function will not impact transmission of such pages. You can use Analytics > Metrics menu to see the Caching policy metrics for a selected service. Browse through the charts to see the Caching policy-related metrics. Page Speed policy accelerates delivery of both HMTL and non-HTML pages. HTML pages are delivered faster even without Page Speed because of Caching. The surge queue trend graph is viewed from Analytics > Metrics menu. This chart shows the pending requests from clients (queued within the surge queue) plotted against the number of claims or request count. A popular DevOps use case for Harmony Controller is automating Blue/Green deployments to enable continuous delivery with zero downtime. Use Harmony Controller to set traffic steering policies for inbound traffic across old (blue) and new (green) deployments while both environments remain online. 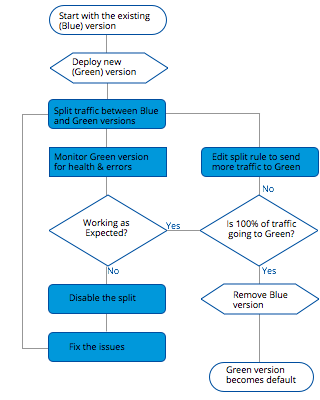 Monitor blue and green server behavior and health metrics to adjust traffic steering rules in real-time. Harmony Controller improves productivity by providing a unified view of the entire Blue/Green deployment process. Harmony Controller supports Blue/Green deployments and precise traffic steering between the different releases. Blue/Green deployment is a powerful technique for directing traffic between old (blue) and new (green)deployments while both environments remain online. Harmony Controller allows its customers to define and manage a split traffic rule for their Blue/Green deployments. That is, customers can specify the IP addresses for their blue and green versions and control what portion of the live production traffic should be directed to which deployment. You can choose a simple percentage split or create a split rule based on anything in HTTP request object, such as a geographic region. Another advantage is that the Harmony Controller customers gain precisely targeted phased rollouts without any effort on the development side, using Blue/Green deployment. Set and change the traffic split rule from the Harmony Controller user interface, where you can also monitor health and success metrics for both deployments. Drive more traffic to the green implementation when the confidence in the green release increases. If problems arise, direct all the traffic back to the blue release. From Harmony Controller screen Select Tenant > Tenant Name > Edit Configuration > Blue/Green. The following settings screen is displayed, select Configure a Blue/Green Deployment. Choose an existing service; this is marked as Blue service. At the same time, a clone is created which is characterized as Green service. Select Next configure Green Service. The screen to configure Green service deployment is displayed. Enter the blue-green service name with a maximum of 30 characters. Enter the integer value of the percentage of traffic that you want to direct to Blue Service and Green Service. All the requests that hit green will be mirrored to blue service. Enter a service condition, and based on this condition the traffic will be redirected to the Green service. Select Next select servers for Green. The Add Servers for Green Service screen is displayed. You can add the servers manually by entering the IP Address and Port number. (Or) choose the servers from Blue service. Select Save Blue/Green deployment, this saves the deployment. The blue-green service is visible from the Tenant > Tenant Name > Edit Configuration>Services tab. You can also edit the service from this tab. Cloud security breaches are becoming an increasing threat with the unprecedented pace at which Cloud Service Delivery Model is getting adapted by businesses and governments. Although shifting to cloud technologies is affordable and fast, businesses are increasingly vulnerable to security breaches and are ill-equipped to counter the sophisticated security threats that can bring the infrastructure down and expose business critical and sensitive data to threats. Hence, it becomes increasingly important for organizations to have real-time insights into application traffic and have strong security policies and controls in place to counter these attacks. 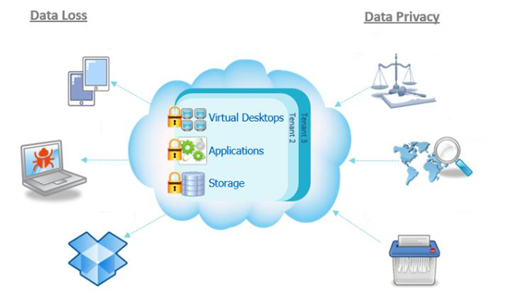 This diagram shows the major concerns in cloud security-Data Privacy and Data Loss. The Security Policies in A10 HarmonyTM Controller provides you with advanced techniques to control server response, prevent threats, and protect sensitive information. 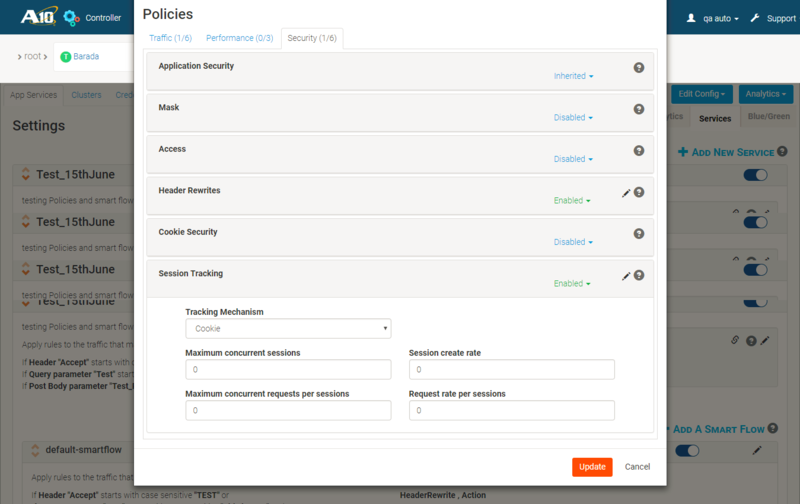 You can configure the application security policies and configurations in A10 HarmonyTM Controller from the Security tab in the Settings page, and the Security Policies tab in a SmartFlow. 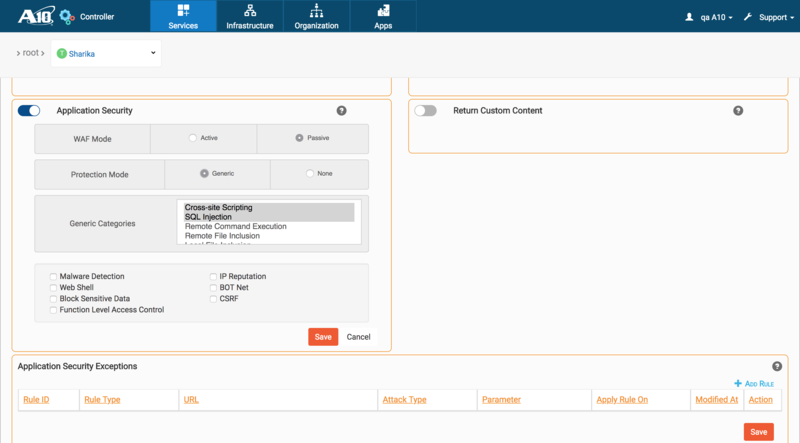 Harmony Controller Web Application Firewall (WAF) is an elastic service for application security with pre-configured rule sets and one-click provisioning. WAF helps defend against malicious activity, web attacks, and application attacks. The figure below explains how WAF is deployed in the network traffic to perform inbound and outbound traffic inspection. Some of the attacks detected (For example, malware, web shells, backdoor, and so on) are detected at the response traffic, and the rest of the attacks (For example, application attacks) are detected at the request traffic. 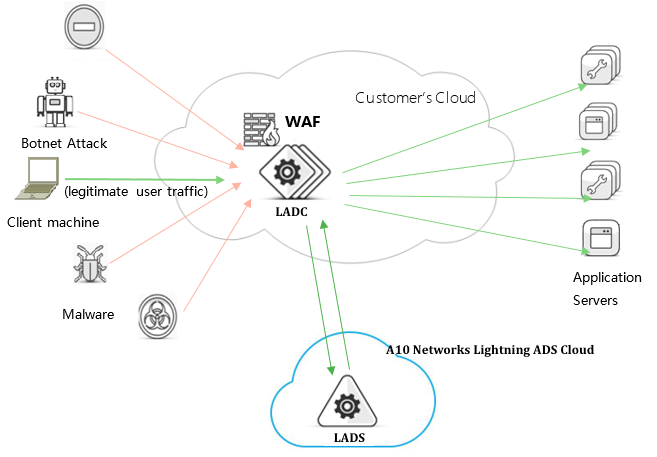 The cloud-specific WAF configured in the Lightning Application Delivery Controller provides real-time protection against application vulnerability attacks on a per application basis. The Harmony Controller architecture provides the added advantage that when new A10 LightningTM ADCs come up in your application infrastructure, the A10 LightningTM ADCs can share the same WAF configurations. The elastic WAF service scales to ensure that sufficient resources are available to process the incoming traffic. Hence you need not re-configure WAF for each new A10 LightningTM ADC added to the deployment. The application security policies (including the WAF policy) scales up as the application infrastructure expands. The single pass integrated execution for WAF, load balancing, and other application delivery directives minimizes latency across the data plane. 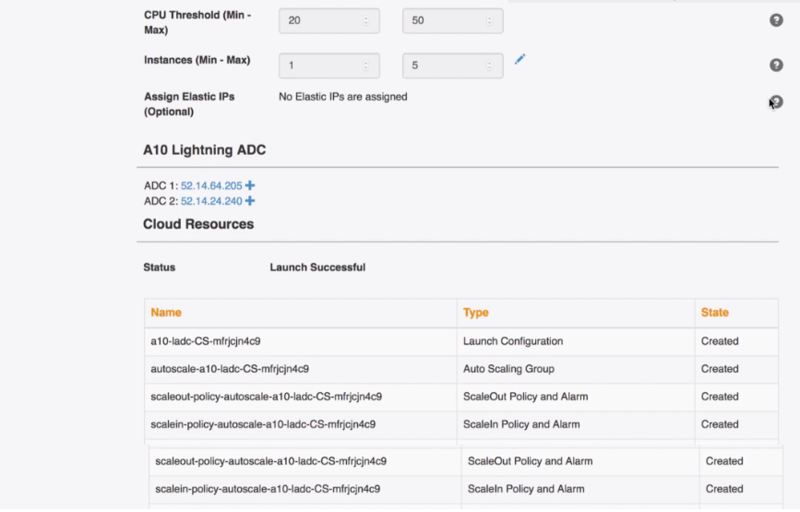 In Harmony Controller, security policies can be quickly enabled in the Cloud Services Controller (CSC) and changes are propagated to all A10 LightningTM ADCs in an A10 LightningTM ADC cluster. This way, an attack can be quickly mitigated. 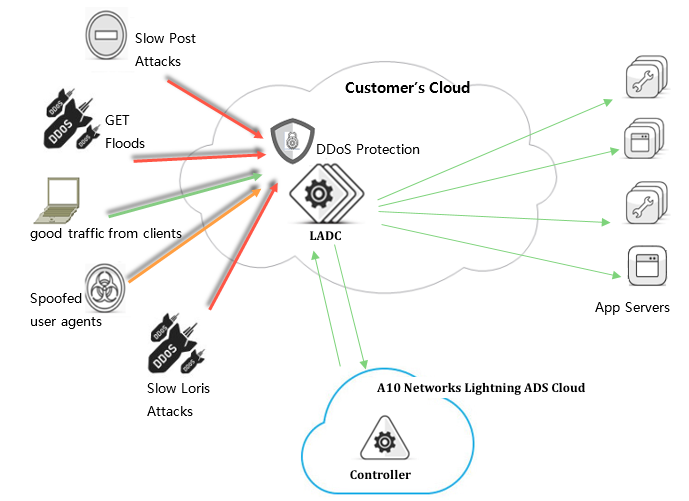 The figure below shows a typical WAF deployment scenario in the A10 LightningTM ADCs. WAF inspects incoming traffic and lets legitimate traffic flow through it. When configured in the Active mode, WAF blocks all malicious traffic based on the generic protection configuration. In Passive mode, WAF provides a warning to the user and lets all traffic (including malicious traffic) pass through it. See Configuring Web Application Firewall for more information. Web Application Firewall (WAF) provides simpler provisioning of application-specific rules for modern web applications and safeguards cloud applications with higher levels of security and compliance. Provisioning and Updating security rules for the broad range of applications used by enterprises are incredibly complex and pose an ongoing challenge for IT teams. Harmony Controller significantly decreases the time required to a provision by providing a one-click rule set which instantly deploys thousands of preconfigured rules to secure popular applications against known threats immediately. Harmony Controller WAF includes preconfigured rule sets that protect against top common vulnerabilities (such as SQL injection and Cross-site scripting), and specific attack vectors in popular Web Applications like Microsoft SharePoint, Outlook Web Access, WordPress, Joomla, and others. This capability takes the guesswork out of determining what security controls are essential for each application, reduces false positives, and reduces the time for deploying application security to seconds. See Configuring Web Application Firewall and Configuring Application Security WAF Policy for more information on WAF configuration. Additionally, provides daily automatic ruleset updates, reducing the risks from emerging attack vectors, and minimizing the occurrence of false-positive vulnerability reports. The WAF security policies can be applied both at Global/Application level as well as Smartflow level. When applied at Application level the same policies can be inherited at Smartflow Application Security. At the Smartflow level, the user gets to choose three application security policy setting options; those are Inherited, Enable, and Disable. To inherit the security policies same as the Global level user can choose an Inherited option. 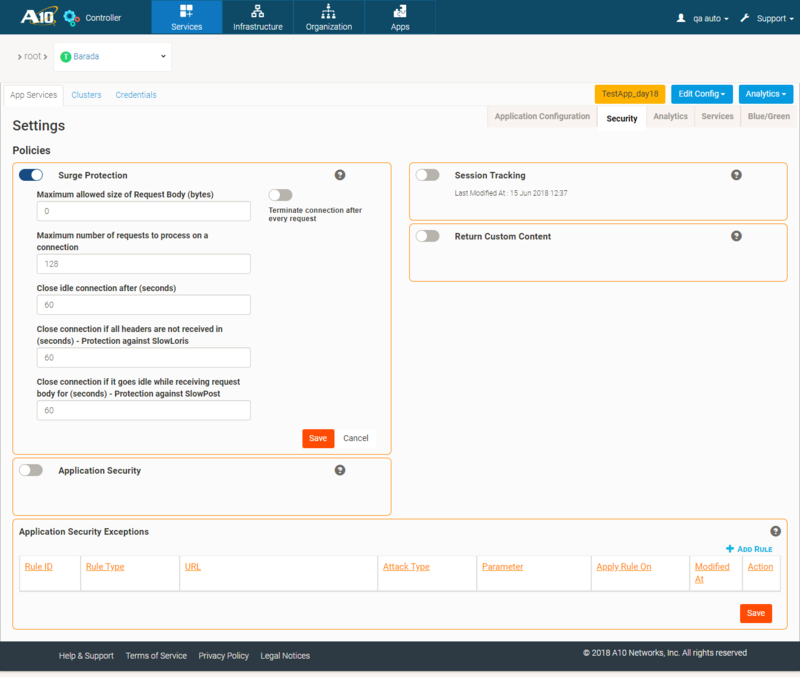 If the user prefers to customize the security policies at Smartflow Application Security level, then can select Enable option. Choose Disable option to disable the policy. Active mode: In Active Mode, WAF prevents common threats from reaching the application server based on the configurations in this mode. Passive mode: In Passive Mode, WAF allows malicious traffic to pass through but with a warning to the IT administrator. In other words, in this mode, WAF raises alerts when threats are detected but do not block the threats. You can create custom alerts using Harmony Controller alert functionality. In the edit SmartFlow screen, under policies click Security Tab > Application Security. 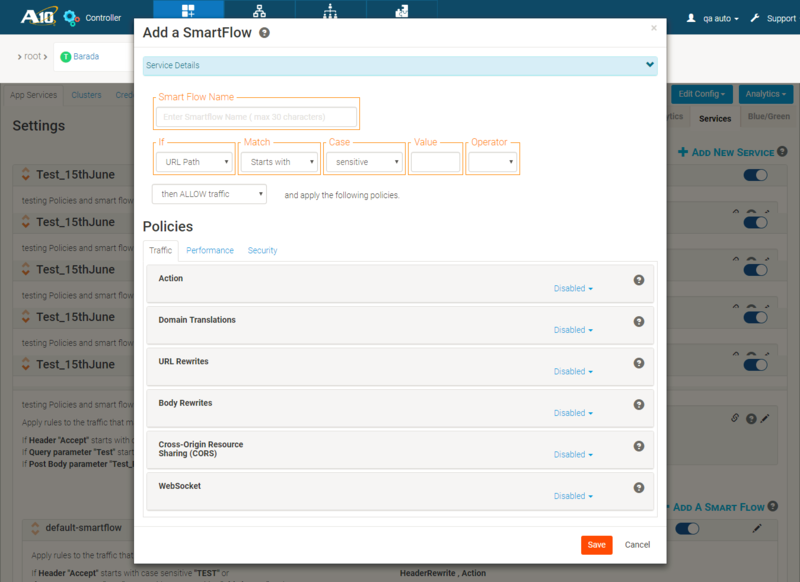 And then, select an option to Enable, Disable, or to Inherit the policies at SmartFlow level. Enables the Application Security at SmartFlow level. Disables the Application Security at SmartFlow level. Inherits the default security policies set at the Application level for the SmartFlow traffic. Set the WAF policies for Generic Protection Mode. Most common forms of threats, such as SQL Injection and Cross-Site Scripting, are prevented in this protection mode. In the edit SmartFlow screen, under policies click Security Tab > Application Security. Enable Application Security policy by clicking the Enable button. Select Active WAF Mode by choosing Active radio button. Select the Protection Mode as Generic. Here, you can select the generic attack categories that should be identified and blocked from the generic attack categories listed on the screen. Hackers inject SQL commands to access or delete database information. Attackers introduce client-side scripts in web pages to bypass access controls and bring down applications and websites. Attackers, use a breached application to execute random commands on the host’s operating system. This involves using remote files located on the server to launch an attack. This involves using local files located on the server to launch an attack, instead of remote files. By default Cross-Site Scripting and SQL Injection attacks are seen selected. You can select multiple categories using the Ctrl key or select all groups using Ctrl + A key combination. IP Reputation-based Traffic Filtering To prevent geographically distributed DoS attacks which can span multiple networks, Harmony Controller WAF provides the IP Reputation-based filter which can apply to applications in different geographic regions or collection of regions. TOR Exit Nodes: The IP addresses that are identified as TOR nodes. Malicious Attack Sources Identified from Web Honeypots: Filter IP addresses of malicious sources identified from web honeypots. When malicious IP addresses are identified with the IP Reputation-based filter, WAF blocks these attacks and records attack-related information in the logs. In the edit SmartFlow screen, under policies click Security Tab > Application Security. To enable IP Reputation, check the box next to it, as shown on the screen. And then, save the security policy. When Block Sensitive Data WAF policy is enabled it allows Harmony Controller to block certain patterns from being captured by the intruders who are trying to attack or capture such data. For now, this policy is designed to block sensitive data such as credit card or debit card number to be exposed to the outsiders. There are many methods attackers employ to upload Web shell backdoor code onto compromised web servers including Remote File Inclusion (RFI), WordPress Tim Thumb Plugin and even non-web attack vectors such as Stolen FTP Credentials. Web shells can be written in any language that a server supports and some of the most common are PHP and.NET languages. These shells can be extremely small, needing only a single line of code or can be fully featured with thousands of lines. Some are self-sufficient and contain all required functionality while others require external actions or a “Command and Control”9D (C&C) client for interaction. When the shell is installed, it will have the same permissions and abilities as the user who put it on the server. Harmony Controller can identify if a client is accessing a web shell/backdoor resource on your website/application by inspecting outbound HTTP data. Harmony Controller can detect and block any web shell/backdoor’s to your application. In the edit SmartFlow screen, under policies click Security Tab > Application Security. To enable Web shell, check the box next to it, as shown in this screen. And then, save the security policy. Attackers build networks of infected computers, known as botnets, by spreading malicious software through emails, websites, and social media. Once infected, these machines can be controlled remotely, without their owner’s knowledge, and used as an army to launch an attack against any target. Botnet attacks attempt to execute botnet code on the server to spread infection. Botnets can generate huge floods of traffic to overwhelm a target. These floods can be produced in multiple ways, such as sending more connection requests than a server can handle or having computers send the victim massive amounts of random data to use up the target’s bandwidth. In the edit SmartFlow screen, under policies click Security Tab > Application Security. To enable Botnet, check the box next to it, as shown in this screen. And then, save the security policy. A bot attack is an unwanted request or set of requests originating from a bad BOT client to your network. Bad bots consume bandwidth, slow down your server, steal your content and look for vulnerability to compromise your server. An Internet Relay Chat (IRC) bot is a set of scripts or an independent program that connects IRC as a client and so appears to other IRC users as another user. An IRC bot differs from a regular client in that instead of providing interactive access to IRC for a human user; it performs automated functions. Harmony Controller can detect and alert on standard attacks originating from IRC Bot clients. Harmony Controller subscribes to the IP reputation list as well as user-agent reputation list for identifying known bad BOTs. Eliminates the traffic from bad BOTs; hence, enhancing the performance of your application servers. You can use the dashboard (Analytics > Dashboard) to get more insights on BOT Protection. For example, you can view the percentage of BOTs in the total number of threats detected in the Top Threats pie diagram in the Dashboard. See Application Security Analytics and Insights section for more information. Web-based Malware is a growing threat to today’s Internet security. Attacks of these types are very prevalent in a cloud and lead to serious security consequences. Millions of malicious URLs are used as distribution channels to propagate malware all over the Web. After being infected, victim systems fall in control of attackers, who can utilize them for various cyber crimes such as stealing credentials, spamming, and distributed denial-of-service attacks. Moreover, it has been observed that traditional security technologies such as firewalls and intrusion detection systems have only limited capability to mitigate this issue. Harmony Controller provides Web-based Malware detection by inspecting HTTP response. The Malware Detection checks the response data for malicious code aimed at attacking clients. Location Response Headers that redirect users to malware sites, and Response Body Payloads that may contain off-site links (scripts and iframes) or full payloads. In the edit SmartFlow screen, under policies click Security Tab > Application Security. To enable Web-based Malware Detection, Check the box next to it, as shown in this screen. And then, save the security policy. Cross Site Request Forgery (CSRF) is one of the most common web application attacks. CSRF occurs when a malicious website, email, blog, or any other program which causes the user’s to perform an undesired function on a trusted site for which the user is currently authenticated. The request from the browser includes any information associated with the browser session or website, such as a cookie, passwords, and so on. A Cross Site Request Forgery (CSRF) attack occurs when the user is authenticated to the site, or when the user clicks on a malicious link, button or any malicious HTML element. Hence, to overcome such attacks Harmony Controller implements a defense mechanism against CSRF by including a hash element in the form submitted by a user. Now, if the attacker wants to access the form submitted, he will need to know the unique key used to create the hash. To add more protection, the hash key generated is made unique for each user sessions. Hence, making it difficult for the attacker to predict its value, avoiding CSRF attacks. The CSRF security feature can be enabled either at the Application level or SmartFlow level by inheriting the default security policies set at the Application level or by enabling the Application security at SmartFlow only. While enabling the CSRF, the form action URLs that need to be protected is an input parameter. A10 LightningTM ADC looks at the responses and adds a hash to all the forms for which the action URL matches with the configured URL. It inspects the requests, and if the request URL matches with the configured form action URL, it verifies the hash value in the request. If the value is not present or is incorrect, then the request is blocked. In the Application Security screen. To enable CSRF, check the box next to it, as shown in this screen. And then, save the security policy. The Function level access control attacks could result from the inadequate security of sensitive request handlers within an application. An application may only hide access to sensitive actions, fail to enforce sufficient authorization for certain activities, or inadvertently expose an action through a user-controlled request parameter. These attacks could be much more complex and be the result of subtle edge-cases in the underlying application logic. A10s Function Level Access Control feature eliminates such attacks by adding a sign in all the links we get in Href, Form action, Iframe source, Frame Source, Location Response Header. If a sign mismatch is identified then the request is not allowed to proceed, thus eliminating Function Level Access Control attacks. While enabling the Function Level Access Control, the form action URLs that need to be protected is an input parameter. A10 LightningTM ADC looks at the responses and adds a hash to all the forms for which the action URL matches with the configured URL. It inspects the requests, and if the request URL matches with the configured form action URL, it verifies the hash value in the request. If the value is not present or is incorrect, then the request is blocked. In the Application Security screen. To enable Function Level Access Control, check the box next to it, as shown in this screen. And then, save the security policy. The Harmony Controller Application Security Exceptions feature allows a user to create an exception for application security rules to handle false positives (an attack detected by the application security, but not one). These false positives are blocked based on the conditions defined in the rules and many other parameters. In some cases, if the user wants such false positives to be allowed even if it looks like a threat or attack but not one, then exceptions are created to overwrite few conditions defined in rule and allow such false positives. The Application Security and Application Security Exceptions are two different policies. However, the exception policies can overlook the security policies set in Harmony Controller. However, these exceptions can also be set up from Analytics > Logs, or from Analytics > App Dashboard > Blocked Request > Logs screen. The Application Security and Application Security Exceptions are two different policies. However, the exception policies can take precedence over the security policies set in Harmony Controller. Secure Socket Layers (SSL) provides your visitors and businesses with an additional layer of security in deployment scenarios. Elastic SSL refers to auto-scaling of SSL operations (handshake plus bulk encryption/decryption) based on SSL traffic. Harmony Controller provides elastic SSL that ensures auto-scaling of SSL resources with the increase in the user traffic to the site. Harmony Controller offloads resource-intensive SSL encryption and decryption tasks to auto-scaling Cloud Services Proxy servers that are adjacent but separate from your dedicated application servers. This efficient architecture enables consistently high throughput at any traffic level providing processing efficiency and cost savings. In a typical Harmony Controller deployment, the Lightning Application Delivery Controller is delivered as an elastic, highly available, resilient cluster. The cluster auto-scale to support variable workloads. Use Harmony Controller’s elastic infrastructure to extend SSL capacity without changing your application code or web servers. Gain visibility into SSL traffic, behavior and potential attacks with Harmony Controller’s comprehensive application delivery analytics dashboards. Harmony Controller accepts client requests for the domain names configured as application domains. When you onboard an application in Harmony Controller, an application domain is created by default (based on your application endpoint). Click Tenant > Tenant Name > Edit Configuration on the Harmony Controller screen, from the drop-down list click Application. Click SSL Settings from the application settings screen. For each Application Domain (FQDN) provide the SSL Settings inputs if SSL is enabled on the Harmony Controller. For an SSL certificate to be trusted, the certificate issued must be by Certificate Authority(CA) that is included in the trusted store of the connecting device. If a trusted CA does not issue the certificate, the connecting device (For example, the web browser) displays an error. However, if the issued certificate is from a trusted source, then the connecting device establishes a secure and reliable connection. The list of certificates from the root certificate to the end-user certificate represents the SSL server certificate chain. While entering the server certificate chain in the SSL settings for your application domain, you must link your server certificate chain of your CA to ensure that you are providing the complete server certificate chain. The private key of the application server which is required to validate the SSL Certificate. Harmony Controller uses TLS (Transport Layer Security), and SSL (Secure Sockets Layer) protocols for secure transmission of data between the Harmony Controller and Application servers. You can select one or more TLS/SSL versions from this list. TLS (Transport Layer Security) and SSL (Secure Sockets Layer) are protocols that provide data encryption and authentication between applications and servers in scenarios where the data is sent across an insecure network. That the terms SSL and TLS are often used interchangeably or in conjunction with each other (TLS/SSL), but one is, in fact, the predecessor of the other SSL 3.0 served as the basis for TLS 1.0. A cipher is an algorithm used to encrypt and decrypt data. When a client initiates an SSL connection with a server, the client and server must agree on a cipher to use to encrypt information. In any two-way encryption process, both parties must use the same cipher. The cipher used depends on the current order of the cipher list kept by the server. The server chooses the first cipher presented by the client that matches a cipher in its list. You can choose the supported cipher algorithms from the list for secure SSL connection between Harmony Controller and the application server. The application traffic is listened by Harmony Controller on the listening port. Note that, before adding any Http2 or SSL ports as a listener port make sure the SSL is enabled. To enable the listener port to go to Application Settings screen and click Add Port/Listner. Here, enter the listening port number and choose SSL or Http2, and then, click Save button. Secure Sockets Layer (SSL) can be enabled to establish a secure encrypted connection between A10 Lightning ADC and application servers. Hence, protecting the sensitive data exchanged during each session. SSL certificate provided must be from a trusted source for an application server to install and enable SSL connection. Click Tenant > Tenant Name > Edit Configuration on the Harmony Controller screen, from the drop-down list click Services. Click ADD NEW SERVICE from the Services settings screen. The Add New Service window displays the following SSL settings. Click on the relevant help buttons to get more information on these options; these options are displayed in the Add Service window if SSL is enabled. Mark the check-box, if you want to enable SSL certificate validation. Verify that the applicant owns, or has the legal right to use, the domain name featured in the application. Mark the check-box, to enable send Server Name option. This flag enables or disables passing of server name through TLS Server Name Indicator (SNI) extension when establishing a connection with the HTTPS application server. If ‘Send Server Name’ is enabled, then this field will override the server name to be passed through SNI when establishing a connection with the HTTPS application server. User can also enter the domain name of the certificate. The application server domain name (if domain name is not configured, then the IP address configured as application server is used). HTTP header rewrite helps to rewrite HTTP request or response headers of the content exchanged between a client and a server. It is often used to keep compatibility between old and new URLs, to turn user-friendly URLs into one’s CMS friendly, and so on. It is also used to mask the information leaked by the application servers in the HTTP headers. Attackers may use this leaked information to identify potential vulnerabilities and launch an attack. Enable the access policy using the Enable button. By default, the screen displays three X-Forwarded header screens. Enter the header name for the required X-Forwarded header screen. Enter the variable names for Header Value. Enter the variable corresponding to the proxy through which the request passes. Select the header rewrite Action. Enable the rules and save the policy. Save the SmartFlow. Action policies allow you to configure rules or action policies which specify a custom content return to the user (For example, an alias response code) for the response codes coming from an application server(s). The action policies enhance the user experienceE2f (For example, if you want to hide a particular response code from the user you can specify an alias code in the action policy configured in the A10 LightningTM ADC so that the user sees the alias code instead of the response code that you want to hide). Under Policies> Traffic > Action > Enable to view the Action policy configuration screen. Set up alias response codes or alias response URLs that A10 LightningTM ADC should provide the user for response codes coming from the Application server. Redirect the user to a redirect URL. Add more than one action policy rule. Configure Action policy rules from the Security tab (Path: Configuration> Security)by enabling Allow merging of rules. Masking allows you to control how servers respond to a user, thereby, increasing application security. Under Policies> Security > Mask > Enable to view the Mask policy configuration screen. Turn on this option to prevent users from knowing what type of web server is used in your operations. Activate this option to avoid unethical users from knowing about your website hosting on multiple servers. Enable this option to ensure users receive friendlier error messages, rather than having to read complicated error messages. In cookie poisoning attack, unauthorized access is made into the application by modifying the contents of the cookie. Solutions to this attack include cleaning up the cookie or encrypting cookie data. Harmony Controller can be configured to provide cookie security by encrypting or suppressing cookies information. When cookie security policy is enabled, if Harmony Controller detects that a cookie does not have a valid signature and does not follow the correct format, it identifies a “Session Cookie Tampering”9D incident. Thus cookie security policy helps to prevent session cookie tampering. The Cookie Security screen in the Smart Flow allows you to enable specific security settings for the cookies transmitted from server through Lightning Application Delivery Controller to the client, and vice versa. Under Policies> Security > Cookie Security> Enable to view the Cookie Security policy configuration screen. When you enable HTTP Only Cookie, the A10 LightningTM ADC is instructing the client (browser) to transmit the return cookies through HTTP connections only. When you enable Secure Cookie, the A10 LightningTM ADC is telling the client(browser) to send the return cookies through HTTPS (secure)connections only. Hence, making the cookieless likely to be exposed to cookie theft through eavesdropping (secretly tempering the cookies). When Encrypt Cookie is enabled, the A10 LightningTM ADC will encrypt the cookie before sending it to the client (browser) for security purposes. When you enable Allow Unknown Cookies, the unknown cookies returned by the browser is allowed to pass through the A10 LightningTM ADC back to the server. This happens in the scenario where the browser writes its cookies and sends it back to the server (through the A10 LightningTM ADC), and you want to allow those cookies to pass through the A10 LightningTM ADC. If you disable this option, unknown cookies sent from the browser will be dropped by the A10 LightningTM ADC, and will not be transmitted to the server. When you add Exempt Cookies, these cookies are exempted from A10 LightningTM ADC’s encryption. That is, the A10 LightningTM ADC do not encrypt these cookies, and they are allowed to pass through it directly to the client (browser). Access Policies allow you can define access policies by specifying allow or deny rules for traffic from IP addresses. Specify the IP address from which traffic should be allowed or denied. Hence, providing the mechanism to build whitelist (allow rules) and blacklists (deny rules) which allows requests based on the IP address or denies unwanted traffic. Whitelist helps in preventing DDoS by allowing traffic only from trusted sources. Blacklist helps in preventing DDoS attacks by restricting traffic from known attackers. Perform the steps below to configure an Allow rule in Harmony Controller. Under Policies> Security > Access > Enable to view the Allow Rule configuration screen. Add an Allow rule by entering the IP address and enable the rule or Enter the value all in the allow rule. Note, that all is the default value. You can add multiple allow rules using the Add Rule button. Save the Rule and policy. Send request to the Lightning Application Delivery Controller from the IP which is allowed. When a request is made from the Application server specified by the IP address in the Allow rule in the Access Policy, 200 OK response code is displayed along with the content in the reply. When you specify the option all in the Access policy, the user receives an appropriate response if he sends requests from any client IP addresses. Under Policies> Security > Access > Deny > Enable to disable the Allow Rule configuration. Enter the IP address (For example, 54.186.134.82). Disable the rule, save the rule and policy; save the SmartFlow. And then send a request to the Application Delivery Controller from the IP which is denied. Add multiple deny rules as required, using the Add Rule button. Save the rules and policy. Send request to the Application Delivery Controller from the IP addresses specified in the Deny rules. When requests are made from the IP addresses specified by Deny rules, a 403 Forbidden response is displayed. Select Tenant > Tenant Name > Edit Configuration> Services> default-smartflow> Edit SmartFlow to edit the default Smart Flow. Choose Security > Access and then disable the Access policy using the Disable option. Controlling Access based on any information in HTTP request. A Distributed Denial of Service (DDoS) attack is an attempt to make an online service unavailable by overwhelming it with traffic from multiple sources. A DDoS attack can cripple your network and take your servers offline, by flooding the network with malicious traffic leaving no room for legitimate traffic. Harmony Controller monitors traffic patterns to identify and protect your business from application-layer Distributed Denial of Service (DDoS) attacks. Clean user traffic is allowed through while the system identifies and drops malicious traffic before it can impact app server resources and availability. Harmony Controller detects and mitigates application layer threats such as SlowLoris, Slow Post, HashDoS, and GET Floods. Application availability is maximized using Harmony Controller DDoS protection even during attacks. The elastic infrastructure allows mitigation to keep pace with application traffic and keep latency to a minimum. The comprehensive traffic and security metrics in the Harmony Controller web interface helps you to learn about specific attacks and patterns in attack detection. Harmony Controller Blacklists and Whitelists and customized Web Application Firewall (WAF) rules help mitigate these attacks. Harmony Controller provides different mitigation mechanisms to thwart Layer 4 network level attacks. By default, the mitigation mechanisms in Harmony Controller include connection pooling, surge protection, request queueing, and auto-scaling capabilities. These can absorb any small to medium intensity attacks. If the attack is planned to exploit HTTP 1.1 protocol limits and is made in the form of SlowLoris, SlowPost or other similar “low and slow”9D attacks, the aggressively configured restrictions in the `Surge Protection policy helps to mitigate the attack. Limiting the total number of user sessions and rate limiting traffic within a session using `Session Tracking policy prevents the attacker from creating junk connections and hogging server resources. If the attack is done using a tool or IP network that is known for bad BOT traffic, the attack is prevented by the configuration setting in Harmony Controller that prevents dangerous BOT attacks. Getting the IP addresses of attackers and create whitelists and blacklists (access/deny rules) or Access Policy rules prevents attacks from known IP addresses. 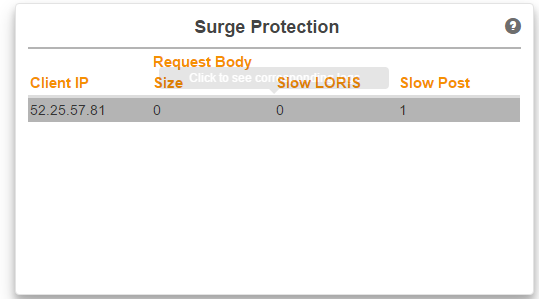 Surge Protection policy is the security policy in Harmony Controller that protects your infrastructure from external network traffic surges caused by DDoS attacks which exploit conditions/parameters such as connection time, connection requests, or provisions of the HTTP protocol such as requests and responses. This policy allows you to specify the limits and timeouts for handling traffic surges present in the network or created by attacks, by aggressively closing the connections based on the policy configuration. Specify limits or timeouts for traffic surges by aggressively closing connections causing surges. Prevent specific DDoS attacks such as SlowLoris and SlowPost by closing idle connections, or specifying limits for slow connections. In attacks that exploit provisions of HTTP protocol, you can specify limits for the HTTP request body length or the maximum number of requests to process on a connection. Click on Tenant > Tenant Name > Edit Configuration> Security tab > Surge Protection menu. Enable Surge Protection policy by clicking on the Enable button. You can set a limit on the HTTP request body length that can be accepted by the HTTP Provider Service to protect your system from malicious Denial-of-Service (DoS) attacks. The system controls this limit by inspecting the Content-Length header of the request or monitoring the chunked request body (in case chunked encoding is applied to the message). If the value of the Content-Length header exceeds the maximum request body length, then the HTTP Provider Service rejects the request with a 413 “Request Entity Too Large”9D error response. You can limit the number of HTTP requests per source IP address, on a connection from the client to the application server. The limit can be an integer value between 0 and 65536. Some attacks involve malicious clients that linger on with partial requests and responses, and indulge in minimum interaction to prevent server idle times from expiring. The attacks slow down applications by consuming system resources, leading eventually to an inability to handle server traffic. These are the “low and slow”9D attacks, as a relatively small number of clients can DoS the server stealthily and slowly, without consuming any significant bandwidth on the network. In Harmony Controller, this field allows setting the time within which the system should close idle connections so that low and slow attacks are prevented. Slow Loris is an attack tool that holds HTTP connections open by sending partial HTTP requests. The headers are sent at regular intervals to occupy the application stack and keep connections from closing. This keeps the server threads and network resources from being released, eventually leading to collapse. The web server quickly reaches its maximum application stack capacity and becomes unavailable for new connections by legitimate users. From a protocol compliance perspective, this appears to be normal traffic which the signature or blacklist-based devices do not detect. In Harmony Controller, this field allows you to protect against SlowLoris attacks by closing HTTP connections when the headers are not received within the specified time interval (in seconds). The default allowed time is 60 seconds. Close connection if all headers are not received in (seconds)- Protection Against SlowLoris: Set the time (in seconds) to close connections if HTTP headers are not received within the specified period. SlowPost is an attack tool which brings down a web server by creating long form field submissions. This is done by iteratively injecting one byte into a web application post field followed by a sleep period. The result is that application threads become stuck because they are occupied with these one-byte POST fragments. In A10 HarmonyTM Controller, this field allows you to protect against SlowLoris attacks by closing HTTP connections if the request body is not received within the specified time interval (in seconds). The default allowed time is 60 seconds. Close connection if it goes idle while receiving request body for seconds)- Protection against SlowPost Set the time (in seconds) to close idle connections while receiving HTTP request body. A session is a series of related browser requests that come from the same client during a period. Session tracking is a mechanism to track a customer session and enforce traffic management policies on sessions. During a session, a series of continuous web requests and responses from the same client to the server can cause traffic congestion and inadequate network bandwidth. This is because HTTP is a stateless protocol and the server does not store the incoming client information. Session tracking enables you to track a user’s progress over multiple servlets or HTML pages during a session. Session tracking mechanisms are required so that Volume-based DDoS attacks caused by large traffic generation from a single client, or a lot of connections created for a short duration from multiple clients can be detected and mitigated. Session Timeout You can specify an interval of time after which HTTP sessions expire. When a session expires, all data stored in the session is discarded. The session timeout is 30 minutes as per industry standards. Session Tracking policy in Harmony Controller allows you to track user sessions and then limit usage of resources by those sessions. 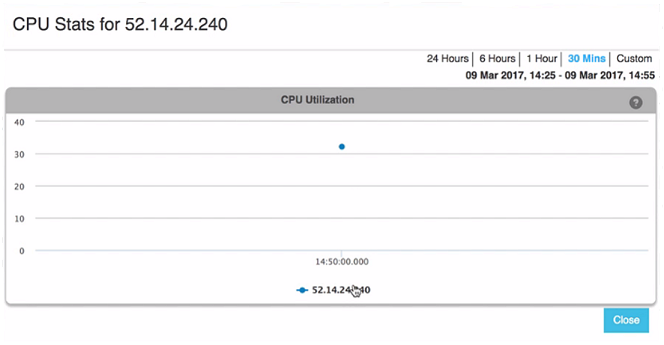 The Harmony Controller performs session tracking to apply rate limits on incoming web requests from clients to servers. You can set these parameters in the session tracking policy in Harmony Controller: - Number of simultaneous user sessions for an application. Some simultaneous requests within a session. The rate of request per session. The rate of session creation per application. See Step 3 of Configuring Session Tracking Policy in Harmony Controller for more information. Click on Tenant > Tenant Name > Edit Configuration > Security tab > Session Tracking to access the Session Tracking screen. This session tracking mechanism is based on tracking the sessions originating from a customer IP address to the application server. A session is identified by the IP address of the web client. This should be used when clients do not support cookies (For example, mobile apps) but are expected to have different public IP addresses. The maximum number of concurrent users accessing the application.You can set any integer value in this field. The rate at which users access the application. This parameter is measured in per second rate. Maximum concurrent requests per sessions. The highest number of concurrent requests per user session. This field is particularly useful in browser sessions (when users access the application through browsers). This parameter is measured in per second rate. The maximum number of concurrent requests in a user session. The number of requests in a user session. This field is particularly useful in API-based sessions. This parameter is measured in per second rate. Session Tracking can also be configured at the Smart Flow level. You can view trend graphs and analytics of your session tracking policy from Analytics> Dashboard > Blocked Requests menu. 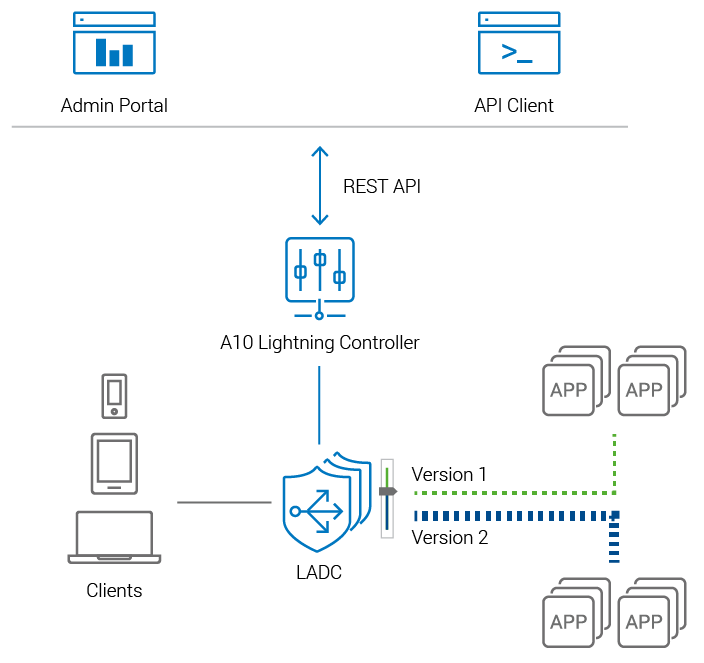 This section discusses in detail the ways to import and export application configuration to and from A10 Lightning Controller. The export function stores the logical configuration of an application from the A10 Lightning Controller to a user specified location. The import function uploads the logical configuration from local storage and creates a logical entity for the application on the A10 Lightning Controller. The export and import can be done in two ways - unencrypted export/import and encrypted export/import. When the configuration is exported without any password, it is an unencrypted export and the returned content is plain text. Where as, when we specify a password during export, the configuration returned is encrypted with the password. When such encrypted file is imported the controller uses the password provided by the user to decrypt the configuration file and create the logical entity. Both the import and export operations are performed using the APIs. The export API exports the configuration for a specific or all the applications for a tenant. The API generates a JSON file and returns it to user with or without encryption. The user can store this file as a configuration backup and use it if there is a need to restore the application. Note: There are two names for a tenant one being the display name and other being the tenant name. In the below mentioned APIs, only name should be used for tenant and not the display name. - String password: Password, if provided then the returned configuration is encrypted. - Boolean excludeServers: If true, back-end servers are excluded from the exported application configurations. - Application Name : Application Name of the application to be exported. - Tenant: Tenant name to which this application belongs. - Provider: Provider name to which the tenant belongs. - @FormDataParam InputStream file: Encrypted or plain configuration file. - @FormDataParam String clusters: Comma separated list of clusters name corresponding to applications to be associated with. - String password: Optional, password to be used for decryption, when provided input file is encrypted. - String infraCredential: Infra-credential in the current tenant. If provided, then infra-credential available in the exported file is replaced by this. - String dnsCredential: Dns-credential in the current tenant. If provided, then dns-credential available in the exported file is replaced by this. - Boolean excludServers: If true, applications are imported excluding the back-end servers (even if exported configuration file has it). Note 1: If user tries to import an application that already exists, the conflict is returned and user needs to delete the existing application and then can import the conflicted application. Note 2: While importing multiple applications, even if failure happens for a single application, no application is imported. This section of the document briefly discusses the various configuration scenarios which a user can implement using the features offered by A10 HarmonyTM Controller. These use cases help users to understand the A10 HarmonyTM Controller features better, and how these features can be effectively used to address various scenarios. For example, If a user wants to block his network for a specific country. In this case, a user can use the SmartFlow feature in A10 HarmonyTM Controller to create a service condition to block traffic for a specific country. Similarly, there are many other use case scenarios discussed in this section of the document. In an ideal scenario when you enter a URL (http://www.example.com) in your web browser, this sends an HTTP command to the Web server to fetch and transfer the requested web page. Here, your web browser is your client and your website host as a server. Sometimes, the clients may be exchanging private information with a server, which needs to be secured for preventing some hacking issue. For this reason, we are redirecting the traffic from HTTP to HTTPS using Smartflow feature in A10 HarmonyTM Controller. The ‘S’ at the end of HTTPS stands for ‘Secure’. It means all communications between your browser and the website are encrypted. HTTPS is often used to protect highly confidential online transactions like online banking and online shopping order forms. In order to redirect the traffic from HTTP to HTTPS in A10 HarmonyTM Controller user can use the SmartFlow feature in the A10 HarmonyTM Controller to create a smart flow condition for a particular service(s) so that any data exchange through A10 HarmonyTM Controller is secure. Rather creating a smart flow condition for each URL request, the user can use https://$host$request_uri as the input in the Redirect URL field and set the condition as Redirect the traffic which will redirect all the URL requests. In this case, a request from the client hits the smart flow and if the condition matches, then the traffic is redirected from HTTP:// to HTTPS:// [temporarily or permanently] for the requested URL. Login to the A10 HarmonyTM Controller. Click Add a new Smartflow and set the conditions and then save. Adding a Smartflow section under Traffic Management Configuration, for more information on Smartflow configuration. A distributed denial-of-service (DDoS) attack occurs when multiple systems flood the bandwidth or resources of a targeted system, usually one or more web servers. Such an attack is often the result of multiple compromised systems (For example, a botnet) flooding the targeted system with traffic. In this use case, we are discussing the Surge protection feature in A10 HarmonyTM Controller which is designed to prevent such attacks. If the attack is made in the form of SlowLoris, SlowPost or other similar low and slow attacks, the aggressively configured restrictions in the Surge Protection policy helps to mitigate such attacks. Thus, limiting the total number of user sessions and rate limiting traffic within a session using Session Tracking policy preventing the attacker from creating junk connections and consuming server resources. Protection against DDoS Attacks section under Security Configuration for more information on Surge Protection policies, and how to configure them. This use case discusses the effort to estimate the Rate Limit configuration values considering the analytics of various other parameters. Based on the session tracking and the per request analytic values combined together user can estimate the values for Rate Limit configuration. A session is defined as a single user agent such as a browser or an API client. Each session has an idle expiry time that defaults to 30 minutes (this cannot be changed currently). A session can be tracked in two ways. Cookies are maintained by LADCs and are returned with every response. Each user agent is uniquely identified by the combination of source IP and port. Only the source IP of the client is used to identify a user agent uniquely. Based on the values obtained from these four parameters as discussed below, the user can estimate the values to configure the Rate Limiting. The maximum number of open requests (for which a response has not been received yet) that can be accepted at any given point in time. This value can be derived from a total number of requests that can be served at any given point in time and the number of concurrent sessions. Number of concurrent requests per session = Total number of requests/Number of concurrent sessions. Let us suppose that it is known from the app server infrastructure/health that they can support a maximum of 10000 outstanding requests at any point in time and the maximum number of concurrent sessions (as seen from the graphs) is 1000. Therefore the number of concurrent requests per session can be set to 10. The maximum number of sessions that can be accepted per second. In other words, this implies the maximum number of user agents that can be served per second. This can be used to block too many new user agents served by the App server infrastructure per second. The maximum number of requests per second that can be made over a session. This will block user agents to send too may request/per second over a session. When there is a requirement for a user to test the new version of the application with zero downtime. In this case, the user can use the Blue/Green feature in A10 HarmonyTM Controller to set the traffic steering policies for inbound traffic across old (blue) and new (green) deployments while both environments remain online. The user can monitor blue and green server behaviour and health metrics to adjust traffic steering rules in real-time. The following use case helps the user to understand how to configure the Blue/Green deployment feature in A10 HarmonyTM Controller to steer traffic to a specific user domain, whenever there are any new additions to the application or to release a new version of the application. In this use case, we are discussing four different Blue/Green deployment scenarios such as specific user, specific browser, specific country, and specific device. Basically, the Blue/Green policy steers the inbound traffic across old (blue) and new (green) deployments while both environments remain online based on the policy configured. Traffic Management Configuration for more information on Blue/Green deployment. Select the Blue Service from the drop-down. Configure the condition(s) to direct the Green traffic based on requirement. The first four steps remain same for all the policy configuration only we are changing the conditions as shown below. To filter the User specific traffic set the conditions as shown below, here If condition can be Header, Cookie, or Query Parameter. To filter the Browser specific traffic set the conditions as shown below. To filter the Country specific traffic set the conditions as shown below, and the value used should be the country code (For example, US). To filter the Device specific traffic set the conditions as shown below. The following use case addresses the user requirement for blocking the traffic from a specific country. For example, the user is required to block traffic from a specific country in order to prevent any malicious attacks to the network, in such case user can create a security policy in A10 HarmonyTM Controller and make the network much secure. The security configuration policies in A10 HarmonyTM Controller allows a business to build a policy that enables blocking off traffic for a specific country based on various parameters. This policy can be enabled for an existing service(s) or for a new service profile. In this example, we are creating a new service and then enabling a smart flow condition to block the traffic for a specific Country. Click Add New Service > Provide Name, Description, IP and Port Number. Set the Service conditions as shown and then Save. Here, US is the country code for the United States. Click Add SmartFlow > Set SmartFlow conditions > Save. Your network is always vulnerable to all kind of threats and attacks. The attack may happen from a known source of network or from an unknown network. In order to prevent such attacks, we need to block such networks. This use case demonstrates the steps to block traffic from such networks using the traffic blocking policy in A10 HarmonyTM Controller. 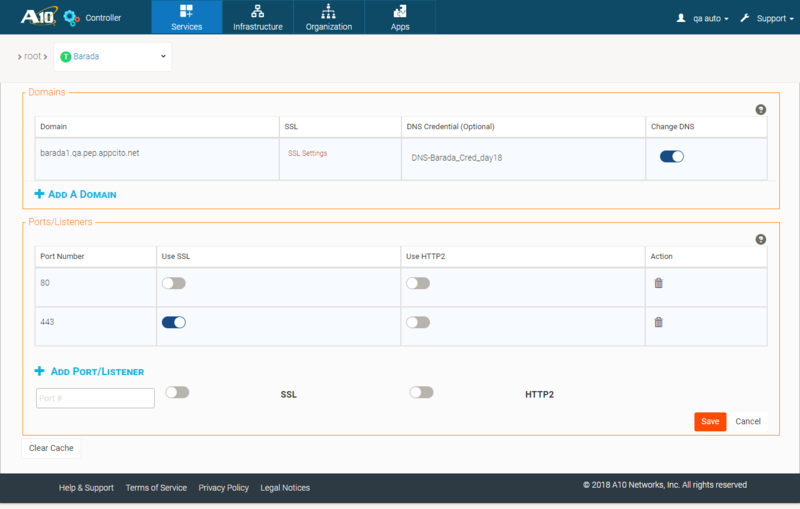 The security configuration policies in A10 HarmonyTM Controller allows a business to build a policy that enables blocking off traffic for a specific Network using the IP address of the client network. This policy can be enabled for an existing service(s) or for a new service profile. In this example, we are creating a new service and then enabling a smart flow condition to block the traffic for a specific Network. Click Add New Service > Provide Name, Description, IP, and Port Number. Set the Service conditions as shown and then Save. Here, the value is the IP address of the network for which the traffic is blocked. Sometimes it is required for a user to block traffic from a specific browser, in order to stop requests from a specific browser which the user application may not support or for many other reasons. For example, let’s say there is a request from Mozilla hits the server; and the application is not so compatible with Mozilla, in such case, the server may not respond to the request and there may be unnecessary space eaten up by such requests and may cause some downtime. As a solution to overcome such issues the A10 HarmonyTM Controller allows a business to build a policy that enables blocking traffic for a specific browser based on conditions like header type, match if, case, and value. This policy can be enabled for an existing service(s) or for a new service profile. In this example, we are creating a new service and then enabling a smart flow condition to block the traffic for a specific browser. Set the Service conditions as shown and then Save. Here, define Header name as User-Agent and value as the name of the Browser (For example, Mozilla in this case). The following use case is very much similar to the use case to block traffic from a specific browser, the difference here is we are blocking traffic from a specific device. The security configuration policies in A10 HarmonyTM Controller allows a business to build a policy that enables blocking traffic for a specific device based on service policy conditions. This policy can be enabled for an existing service(s) or for a new service profile. In this example, we are creating a new service and then enabling a smart flow condition to block the traffic for a specific device. Set the Service conditions as shown and then Save. Here, define Header name as User-Agent and value as the name of the Device (For example, Macintosh in this case). © Copyright 2018 A10 Networks Inc, All rights reserved.